2012-02-16 First worldwide family litigation filed litigation Critical https://patents.darts-ip.com/?family=39092672&utm_source=google_patent&utm_medium=platform_link&utm_campaign=public_patent_search&patent=CN101535352(B) "Global patent litigation dataset” by Darts-ip is licensed under a Creative Commons Attribution 4.0 International License. 本发明公开了一种包括在包含引发剂和聚合剂的含水介质中使至少一种氟化单体聚合以形成含氟聚合物颗粒的水分散体的方法，所述聚合剂包含：数均分子量为至少约800g/mol的氟聚醚酸或其盐；以及具有下式结构的含氟表面活性剂：[R1-On-LA-]Y+；其中R1为可包含醚键的直链或支链的部分氟化或完全氟化的脂族基团；n为0或1；L为可以非氟化、部分氟化或完全氟化的并且可包含醚键的直链或支链亚烷基；A-为选自下列的阴离子基团：羧酸根、磺酸根、磺酰胺阴离子和膦酸根；并且Y+为氢、铵或碱金属阳离子；前提条件是R1-On-L-的链长不大于6个原子。 The present invention discloses a method comprising an aqueous medium comprising initiator and polymerization agent manipulation of at least one fluorinated monomer to form the water method of dispersion of particles of fluoropolymer, said polymerization agent comprising: a number-average molecular weight of at least about 800g / mol of fluoropolyether acid or salt thereof; and a fluorinated surfactant having the following structural formula: [R1-On-LA-] Y +; wherein R1 is an ether bond may include straight or branched chain partially fluorinated or fully fluorinated aliphatic group; n is 0 or 1; L is can be a non-fluorinated, partially fluorinated or fully fluorinated and may contain an ether bond, straight-chain or branched alkylene group; A- is selected from the group consisting of anionic groups: carboxylate, sulfonate, sulfonamide anion, and phosphonate; and Y + is hydrogen, ammonium or alkali metal cation; with the proviso that R1-on-L- chain to grow 6 atoms. 本发明涉及在含水聚合反应介质中进行氟化单体的分散聚合反应的方法。  The present invention relates to a method for the aqueous dispersion polymerization in the polymerization reaction medium of fluorinated monomers. 氟化单体的含水分散聚合反应的典型方法包括将氟化单体送入包含含氟表面活性剂和去离子水的热反应器中。 Typical Method  The aqueous dispersion polymerization of fluorinated monomers include fluorinated monomers fed to the thermal reactor comprising a fluorine-containing surfactant and deionized water. 在所述反应器中使用石蜡作为某些聚合反应的稳定剂，例如聚四氟乙烯(PTFE)均聚物。 Paraffin as certain stabilizer in the polymerization reactor, such as polytetrafluoroethylene (PTFE) homopolymer. 使用自由基引发剂溶液，并且随着聚合反应的进行，加入额外的氟化单体以保持压力。 Solution using a radical initiator as the polymerization reaction proceeds, additional fluorinated monomer to maintain the pressure. 在某些聚合物例如可熔融加工的TFE共聚物的聚合反应中使用链转移剂以调节熔融粘度。 Chain transfer agent in the polymerization reaction of certain polymers such as melt-processible TFE copolymers to adjust the melt viscosity. 在若干小时后，停止给料，放空反应器，并且用氮气吹扫，并且将容器中的粗分散体转移到冷却容器中。 After several hours, the feeds are stopped, the reactor is vented, and purged with nitrogen, and the raw dispersion in the transfer vessel to a cooling vessel. 为了可用于金属、玻璃和织物的含氟聚合物涂层中，通常将聚合物分散体转移到分散体浓缩操作过程中，这可制得可用作涂层的稳定分散体。  The fluoropolymer coating can be used for metal, glass and fabrics, typically a polymer dispersion was transferred to a dispersion concentration operation process, can be prepared which can be used as a stable coating dispersion. 可制备某种等级的PTFE分散体以用于产生精细粉末。 PTFE dispersion may be prepared to a certain level for producing fine powder. 为此用途，将分散体凝结，除去含水介质，并且使PTFE干燥以产生精细粉末。 For this use, the dispersion is coagulated, the aqueous medium was removed and dried to produce the PTFE fine powder. 也可将用于模制树脂用途的可熔融加工的氟聚合物分散体凝结，并且干燥凝结的聚合物，然后加工成简便形式诸如薄片、碎片或小丸，以用于后续熔融加工操作。 May also be used for purposes of resin molding melt-processible fluoropolymer dispersion is coagulated, the coagulated and dried polymer is then processed into a convenient form such as flake, chip or pellet for use in subsequent melt-processing operations. 如授予Punderson的美国专利3，391，099中所述,分散聚合反应涉及两个通常不同的阶段。  U.S. Patent No. granted Punderson as in the 3,391, dispersion polymerization generally involves two distinct stages. 反应初期为成核阶段，期间形成一定数量的聚合反应位点或核心。 The initial reaction stage of nucleation, formation or polymerization sites during a certain number of core. 随后，进行到生长阶段，期间氟化单体在已形成的颗粒上发生聚合反应，而形成很少的新的颗粒或不形成任何新的颗粒。 Subsequently, the growth phase occurs during the polymerization of fluorinated monomers in the particles have been formed, and the formation of new particles little or no formation of any new particles. 高固含量含氟聚合物分散体的成功制备一般需要存在含氟表面活性剂，尤其是在聚合反应后面的生长阶段中，以稳定分散体，防止含氟聚合物颗粒凝结。 Successful preparation of high solids fluoropolymer dispersion generally requires the presence of a fluorinated surfactant, especially in the later growth stage of the polymerization reaction in order to stabilize the dispersion to prevent coagulation of the fluoropolymer particles. 用于聚合反应中的含氟表面活性剂通常是阴离子、非调聚型表面活性剂，可溶于水，并且在反应条件下是稳定的。  used in the polymerization reaction of the fluorinated surfactant is usually anionic, non-telogenic surfactants, soluble in water, and is stable under the reaction conditions. 使用最广泛的含氟表面活性剂是如授予Berry的美国专利2，559，752中所述的全氟链烷羧酸及其盐，具体地讲是通常被称为C8的全氟辛酸及其盐，和通常被称为C9的全氟壬酸及其盐。 The most widely used fluorosurfactants are as Berry, U.S. Patent No. perfluoroalkane carboxylic acids and salts thereof according to 2,559,752, in particular is often referred to C8 perfluoro octanoic acid and salts thereof, and perfluoro nonanoic acid and salts thereof, commonly referred to C9. 由于近来与全氟辛酸及其盐相关的环境问题，因此引起了对于在含氟聚合物聚合反应过程中减少或除去全氟辛酸及其盐的关注。 Because of recent environmental issues associated with perfluorooctanoic acid and salts thereof, thus causing a concern about the decline in the fluoropolymer polymerization reaction or remove perfluorooctanoic acid and salts thereof. 全氟辛烷磺酰基化合物(PFOS)具有类似的环境问题，其为8碳含氟表面活性剂，以前作为抗污剂以商标Scotchguard®由3M出售。  perfluorooctane sulfonate (PFOS) have similar environmental problems, which is 8 carbon fluorinated surfactant, an antifoulant as previously Scotchguard® trademark sold by 3M. 为了获得诸如抗污的用途，已使用具有短疏水链长的含氟表面活性剂例如全氟丁烷磺酰基化合物来替代全氟辛烷磺酰基化合物。 In order to achieve the purpose, such as a stain, for example, it has been used with perfluorobutane sulfonate instead perfluorooctane sulfonate long short-chain hydrophobic fluorinated surfactant. 然而，如果尝试在商业化含氟单体聚合反应中使用短疏水链长的含氟表面活性剂来获得所期望的固体浓度，则将在反应器中形成显著量的未被分散的聚合物(也被称为凝结物)。 If, however, commercial attempts fluorinated monomers a fluorinated surfactant used in the reaction of short hydrophobic chain length to obtain the desired solids concentration, a significant amount of non-dispersible polymer will be formed in the reactor ( also referred to as condensate). 此凝结物通常必须被当作废物丢弃。 This condensation is typically must be discarded as waste. 例如，短链氟醚CF3CF2CF2OCF (CF3) COOH作为聚四氟乙烯(PTFE)的聚合反应表面活性剂公开于授予Garrison的美国专利3，271，341的实施例XII中。 For example, short chain fluoroether CF3CF2CF2OCF (CF3) COOH as polytetrafluoroethylene (PTFE) polymerization surfactants are disclosed in U.S. Patent No. Garrison embodiment of XII 3,271,341. 然而，在生成1243克PTFE分散体的此实施例中，产生了500克凝结物，即，所生成的PTFE总重量中有29%为凝结物。 However, in 1243 g PTFE dispersion generated in this example, 500 grams of condensate produced, i.e., the total weight of PTFE produced in the condensate was 29%. 与使用短链含氟表面活性剂不同，其它已知的方法在氟聚合物的聚合反应中使用较高分子量的物质，诸如氟聚醚。  using different short-chain fluorine-containing surfactants, other known methods the use of higher molecular weight species in the polymerization of fluoropolymers, such as perfluoropolyether. 授予Gianetti等人的美国专利4，864，006公开了在具有中性端基的全氟聚醚(以含水微乳液形式使用的全氟聚醚油)的存在下进行的氟化单体聚合反应。 Grant the Gianetti et al U.S. Patent 4,864,006 discloses a perfluoropolyether (used in the form of an aqueous microemulsion perfluoropolyether oil) having neutral end groups in the presence of polymerization of fluorinated monomers . 全氟聚醚油具有至少约500的分子量，并且可使用适宜的表面活性剂来制备所述油的含水微乳液，所述表面活性剂选自已知的全氟化羧酸或磺酸，或选自具有一个或两个酸性端基的全氟聚醚。 Perfluoropolyether oil having a molecular weight of at least about 500, and may be prepared by aqueous microemulsion of the oil using a suitable surfactant, said surfactant selected from known perfluorinated carboxylic or sulfonic acid, or selected from since a perfluoropolyether having acid end groups or both. 授予Morgan等人的US6, 395, 848公开了经改良的氟化单体的含水分散聚合反应工艺，所述工艺使用含氟表面活性剂与全氟聚醚羧酸或磺酸或其盐的组合，所述含氟表面活性剂可以是氟代烷基羧酸或磺酸或其盐，或氟代烷氧基芳基磺酸或其盐。 Morgan et al., Granted US6, 395, 848 discloses a modified polyether compositions by aqueous dispersion polymerization of fluorinated monomers process, the process using a fluorine-containing surfactant and perfluorinated carboxylic or sulphonic acid or salt thereof the fluorinated surfactant may be a fluoroalkyl carboxylic or sulfonic acid or a salt thereof, or fluoroalkoxy aryl sulfonic acid or salt thereof. 用于Morgan等人的实施例中的全氟聚醚羧酸或磺酸或其盐具有2000至7500范围内的分子量。 Example for Morgan et al perfluoropolyether carboxylic or sulphonic acid or salt thereof has a molecular weight within the range of 2000 to 7500. Morgan等人公开的氟代烷基羧酸或磺酸表面活性剂是通常用于分散聚合反应中的那些，诸如全氟辛酸或其盐以及其它可被单独用作聚合反应表面活性剂的具有相同或更长链长的含氟表面活性剂。 Morgan et al., Disclosed fluoroalkyl carboxylic or sulfonic acid surfactants are those commonly used in dispersion polymerization reaction, such as perfluoro octanoic acid or its salts can be used alone as well as other polymerization surfactant having the same or more long long chain fluorinated surfactant. 前提条件是R1-On-L-的链长不大于6个原子。  with the proviso that R1-On-L- chain grow to 6 atoms. 由本发明形成的含氟聚合物分散体由含氟聚合物颗粒构成，所述含氟聚合物颗粒由至少一种氟化单体构成，即，其中至少一种单体包含氟，优选具有至少一个氟的烯属单体，或连接在双键碳上的全氟烷基。  Fluoropolymer dispersions formed by the present invention is composed of particles of fluoropolymer, said fluoropolymer particles consists of at least one fluorinated monomer, i.e., wherein at least one of the monomers contains fluorine, preferably alkenyl having at least one fluorine-based monomer, or a perfluoroalkyl group connected to a carbon of the double bond. 用于本发明方法中的氟化单体优选独立地选自四氟乙烯(TFE)、六氟丙烯(HFP)、三氟氯乙烯(CTFE)、三氟乙烯、六氟异丁烯、全氟烷基乙烯、氟代乙烯基醚、氟乙烯(VF)、偏二氟乙烯(VF2)、全氟-2，2-二甲基-1，3-二氧杂环戊烯(PDD)、全氟-2-亚甲基-4-甲基-1，3-二氧杂环戊烷(PMD)、全氟(烯丙基乙烯基醚)和全氟(丁烯基乙烯基醚)。 Fluorinated monomer process of the invention is preferably independently selected from tetrafluoroethylene (TFE), hexafluoropropylene (HFP), chlorotrifluoroethylene (CTFE), trifluoroethylene, hexafluoroisobutylene, perfluoroalkyl ethylene, fluorovinyl ethers, vinyl fluoride (VF), vinylidene fluoride (the VF2), perfluoro-2,2-dimethyl-1,3-dioxole (the PDD), perfluoro - 2-methylene-methyl-1,3-dioxolane (PMD), perfluoro (allyl vinyl ether) and perfluoro (butenyl vinyl ether). 优选的全氟烷基乙烯单体是全氟丁基乙烯(PFBE)。 A preferred perfluoroalkyl ethylene monomer is perfluorobutyl ethylene (PFBE). 优选的氟代乙烯基醚包括全氟(烷基乙烯基醚)单体(PAVE)，诸如全氟(丙基乙烯基醚)(PPVE)、全氟(乙基乙烯基醚)(PEVE)和全氟(甲基乙烯基醚)(PMVE)。 Preferred fluorovinyl ethers include perfluoro (alkyl vinyl ether) monomers (PAVE), such as perfluoro (propyl vinyl ether) (PPVE), perfluoro (ethyl vinyl ether) (PEVE), and perfluoro (methyl vinyl ether) (PMVE). 非氟化烯属共聚单体诸如乙烯和丙烯可与氟化单体共聚。 Non-fluorinated ethylenically metal such as ethylene and propylene comonomers may be copolymerized with fluorinated monomers. 氟代乙烯基醚还包括可用于将官能团引入到氟聚合物中的那些。  fluoroalkyl vinyl ether may further comprises a means for introducing functionality into fluoropolymers are. 这些包括CF2=CF- (O-CF2CFRf) ,-O-CF2CFR ' fS02F，其中Rf 和R ' f 独立地选自F、Cl 或具有I 至10个碳原子的全氟化烷基，a = 0、1或2。 These include CF2 = CF- (O-CF2CFRf), -O-CF2CFR 'fS02F, wherein Rf and R' f are independently selected from F, Cl or a perfluorinated alkyl group having I to 10 carbon atoms, a = 0 , 1 or 2. 此类聚合物公开于美国专利3，282，875 ((CF2=CF-O-CF2CF (CF3) -O-CF2CF2SO2F,全氟(3，6- 二氧杂-4-甲基-7-辛烯磺酰氟))以及美国专利4，358，545 和4，940，525 (CF2 = CF-O-CF2CF2SO2F)中。另一个实例是美国专利4，552，631中公开的全氟(4，7- 二氧杂-5-甲基-8-壬烯酸)甲酯CF2 =CF-0-CF2-CF(CF3)-0-CF2CF2C02CH3。具有腈、氰酸酯、氨基甲酸根和膦酸官能团的类似氟代乙烯基醚公开于美国专利5，637，748,6, 300，445和6，177，196中。 Such polymers are disclosed in U.S. Patent No. 3,282,875 ((CF2 = CF-O-CF2CF (CF3) -O-CF2CF2SO2F, perfluoro (3,6-dioxa-4-methyl-7-octene sulfonyl fluoride)), and U.S. Patent Nos. 4,358,545 and 4,940,525 (CF2 = CF-O-CF2CF2SO2F) in. another example is disclosed in U.S. Patent No. 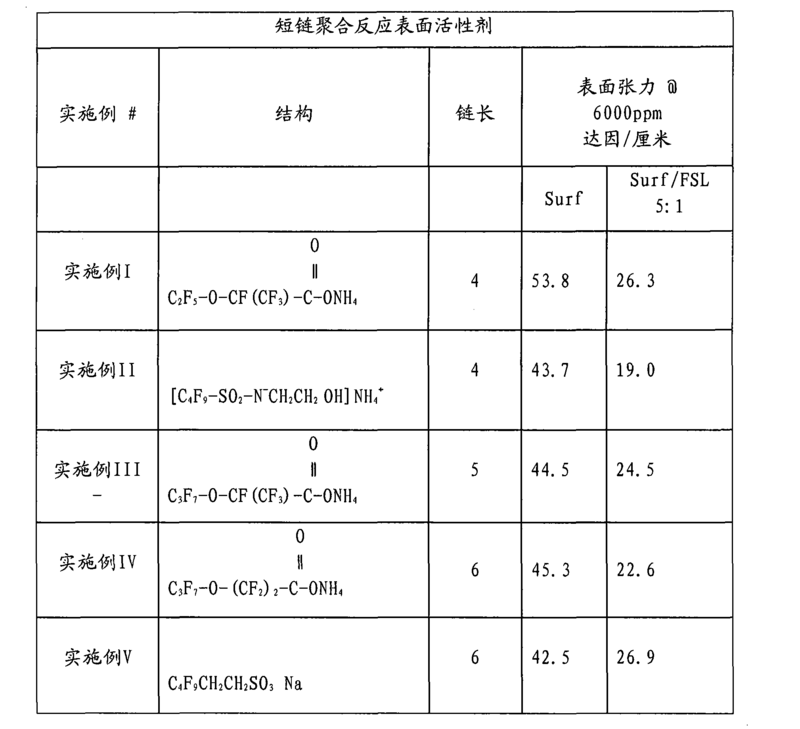 4,552,631 in perfluoro (4,7 - dioxa-5-methyl-nonanoic acid) methyl ester CF2 = CF-0-CF2-CF (CF3) -0-CF2CF2C02CH3 nitrile, cyanate, carbamate, and phosphonic acid functional groups. similar fluorovinyl ethers disclosed in U.S. Patent No. 5,637,748,6, 300,445 and 6,177,196. 当制备包括改性PTFE在内的聚四氟乙烯(PTFE)的分散体时，本发明是尤其有用的。  When preparing polytetrafluoroethylene (PTFE) including modified PTFE dispersion including, the present invention is particularly useful. PTFE和改性的PTFE通常具有至少约IX IO8Pa-s的熔融蠕变粘度，并且在该高熔融粘度下，所述聚合物在熔融态不显著流动，因此是不可熔融加工的聚合物。 PTFE and modified PTFE typically have a melt creep viscosity of at least about IX IO8Pa-s, and at the high melt viscosity, the polymer does not flow significantly in the molten state, and therefore is non-melt processible polymer. 聚四氟乙烯(PTFE)是指不存在任何显著共聚单体的自身聚合的四氟乙烯。 Polytetrafluoroethylene (PTFE) refers to the polymerized tetrafluoroethylene by itself to any significant comonomer present. 改性PTFE是指具有较小浓度共聚单体的TFE共聚物，使所得聚合物的熔点没有显著降低至PTFE熔点以下。 Modified PTFE refers to copolymers of TFE with small concentrations of comonomer that the melting point of the resultant polymer is not substantially reduced to less melting point of PTFE. 此共聚单体的浓度优选小于I重量％,更优选小于0.5重量％。 This concentration of the comonomer is preferably less than wt% I, and more preferably less than 0.5 wt%. 优选使用至少约0.05重量％的最小量以具有显著的效果。 Preferably at least a minimum of about 0.05 wt% of an amount to have a significant effect. 改性PTFE包含少量共聚单体调节剂，其可改善烘焙(熔融)期间的成膜能力，诸如全氟烯烃，特别是六氟丙烯(HFP)或全氟(烷基乙烯基醚)(PAVE)，其中所述烷基包含I至5个碳原子，优选全氟(乙基乙烯基醚)(PEVE)和全氟(丙基乙烯基醚)(PPVE)。 The modified PTFE contains a small amount of comonomer modifier which improves film forming capability during baking (fusing), perfluoro olefins, particularly hexafluoropropylene (HFP) or perfluoro (alkyl vinyl ether) (PAVE) such as , wherein the alkyl group contains I to 5 carbon atoms, with perfluoro (ethyl vinyl ether) (PEVE) and perfluoro (propyl vinyl ether) (PPVE). 还包括三氟氯乙烯(CTFE)、全氟丁基乙烯(PFBE)或其它将大体积侧基引入到分子中的单体。 Further comprising chlorotrifluoroethylene (CTFE), perfluorobutyl ethylene (PFBE), or other bulky side groups into the molecule of the monomer. 当制备可熔融加工的氟聚合物分散体时，本发明是尤其有用的。  When preparing melt-processible fluoropolymer dispersion, the present invention is particularly useful. 所谓可熔融加工是指使用常规的加工设备诸如挤出机和注模机可在熔融态下加工聚合物(即，由熔融物加工成成型制品，诸如薄膜、纤维和管等，其表现出足够的强度和韧性以可用于它们的指定用途)。 Refers to the so-called melt-processible using conventional processing equipment such as extruders and injection molding machine polymer can be processed in the molten state (i.e., from the melt into shaped articles such as films, fibers, and tubes etc. that exhibit sufficient the strength and toughness to be used for their intended purpose). 此类可熔融加工的氟聚合物的实例包括均聚物诸如聚三氟氯乙烯，或四氟乙烯(TFE)与至少一种可共聚氟化单体(共聚单体)的共聚物，所述可共聚氟化单体通常以足量存在于所述聚合物中，以将所述共聚物的熔点显著降低至TFE均聚物聚四氟乙烯(PTFE)熔点以下，例如降低至不超过315°C的熔融温度。 Examples of such fluoropolymers include melt-processible homopolymers such as polychlorotrifluoroethylene or copolymers of tetrafluoroethylene (TFE) copolymer of at least one fluorinated copolymerizable monomer (comonomer), said fluorinated copolymerizable monomer is generally present in a sufficient amount of the polymer, the melting point of the copolymer decreased significantly TFE homopolymer polytetrafluoroethylene (PTFE) melting point, for example to not more than 315 ° C of the melting temperature. 可熔融加工的TFE共聚物通常将一定量共聚单体掺入到所述共聚物中，以提供依照ASTM D-1238，在具体共聚物标准温度下测定的具有约l-100g/10min熔融流动速率(MFR)的共聚物。  The melt-processible TFE copolymer typically incorporates an amount of comonomer into the copolymer to provide, having about l-100g measured at a specific temperature of the copolymer in accordance with standard ASTM D-1238 / 10min the melt flow rate (MFR) of the copolymer. 依照如美国专利4，380, 618中所述改进的ASTM D-1238方法，在372°C下测定，所述熔融粘度优选为至少约IO2Pa.S，更优选在约IO2Pa.s至约IO6Pa.S，最优选约IO3至约IO5Pa.s的范围内。 In accordance with U.S. Patent No. 4,380, 618 in the modified method of ASTM D-1238, measured at 372 ° C, the melt viscosity is preferably at least about IO2Pa.S, more preferably from about to about IO2Pa.s IO6Pa. S, most preferably from about IO3 to the range of about IO5Pa.s. 其它可熔融加工的氟聚合物是乙烯(E)或丙烯(P)与TFE或CTFE的共聚物，特别是ETFE、ECTFE和PCTFE。 Other melt-processible fluoropolymer is ethylene (E) or propylene (P) and a copolymer of TFE or CTFE, in particular ETFE, ECTFE and PCTFE. 优选可用于本发明实施中的可熔融加工的共聚物包含至少约40至98摩尔％的四氟乙烯单元和约2至60摩尔％的至少一种其它单体。 Copolymer  Preferred embodiments of the present invention may be used in the melt-processible comprises at least about 40 to 98 mol% tetrafluoroethylene units and about 2-60 mole% of at least one other monomer. 含有TFE的优选共聚单体是具有3至8个碳原子的全氟烯烃诸如六氟丙烯(HFP)和/或全氟(烷基乙烯基醚)(PAVE)，其中直链或支链的烷基包含I至5个碳原子。 Preferred comonomers are TFE-containing perfluoroolefin having 3 to 8 carbon atoms, hexafluoropropylene (HFP) and / or perfluoro (alkyl vinyl ether) (PAVE), wherein a straight-chain or branched alkoxy, such as group containing I to 5 carbon atoms. 优选的PAVE单体是其中烷基包含1、2、3或4个碳原子的那些，并且所述共聚物可使用若干PAVE单体制得。 Preferred PAVE monomers are those in which the alkyl group contains 3 or 4 carbon atoms, and the copolymer may be obtained using several PAVE monomers. 优选的TFE共聚物包括FEP (TFE/HFP 共聚物)、PFA(TFE/PAVE 共聚物)、TFE/HFP/PAVE(其中PAVE 为PEVE 和/ 或PPVE)、MFA(TFE/PMVE/PAVE，其中PAVE的烷基具有至少两个碳原子)和THV (TFE/HFP/VF2)。 Preferred TFE copolymers include FEP (TFE / HFP copolymer), PFA (TFE / PAVE copolymer), TFE / HFP / PAVE (wherein PAVE is PEVE and / or PPVE), MFA (TFE / PMVE / PAVE, wherein PAVE alkyl group having at least two carbon atoms) and THV (TFE / HFP / VF2). 还可用的聚合物是聚偏氟乙烯(PVDF)的成膜聚合物，和偏二氟乙烯以及聚氟乙烯(PVF)的共聚物，以及氟乙烯的共聚物。  Further useful polymers are polyvinylidene fluoride (PVDF) film forming polymer, and vinylidene fluoride, and polyvinyl fluoride (PVF) and a copolymer of fluoride copolymers. 当制备氟烃弹性体时，本发明也是有用的。  When preparing fluorocarbon elastomer, it is also useful in the present invention. 这些弹性体通常具有低于25°C的玻璃化转变温度，并且在室温下表现出很小的结晶度或不表现出任何结晶度。 These elastomers typically have a glass transition temperature below 25 ° C and, at room temperature and exhibits a small degree of crystallinity or does not exhibit any crystallinity. 按所述氟烃弹性体的总重量计，由本发明的方法制得的氟烃弹性体共聚物通常包含25至70重量％的第一氟化单体共聚单元，所述第一氟化单体共聚单元可以是偏二氟乙烯(VF2)或四氟乙烯(TFE)。 The fluorocarbon elastomer by the total weight of the fluorocarbon elastomer copolymers of the method of the present invention have typically comprises 25 to 70 wt% of copolymerized units of a first fluorinated monomer, the first monomer is fluorinated may be copolymerized units of vinylidene fluoride (the VF2) or tetrafluoroethylene (TFE). 氟烃弹性体中的残余单元可由一种或多种不同于所述第一单体的其它共聚单体构成，选自氟化单体、烷烯烃、以及它们的混合物。 Fluorocarbon elastomers residual unit may be different from the first one or more other monomer copolymerizable monomers selected from fluorinated monomers, alkyl olefins, and mixtures thereof. 由本发明方法制得的氟烃弹性体还可任选地包含一种或多种固化点单体单元。 Prepared by the process of the present invention obtained fluorocarbon elastomer may optionally include one or more cure site monomer units. 如果存在的话，按所述氟烃弹性体的总重量计，共聚固化点单体的含量通常为0.05至7重量％。 If present, as described fluorocarbon elastomer on the total weight of copolymerized cure site monomers are typically present from 0.05 to 7% by weight. 适宜固化点单体的实例包括:i)含溴_、碘-、或氯-的氟化烯烃或氟化乙烯基醚；ii)含腈基的氟化烯烃或氟化乙烯基醚；iii)全氟(2-苯氧基丙基乙烯基酿)；和iv)非共辄双稀。 Examples of suitable cure site monomers include: i) bromine-containing _, iodine -, or chlorine - containing fluorinated olefins or fluorinated vinyl ethers; ii) fluorinated olefins or fluorinated vinyl ethers having a nitrile group; iii) perfluoro (2-phenoxypropyl vinyl stuffed); and iv) non-conjugated double dilute Noir. [0031 ] 优选的TFE基氟烃弹性体共聚物包括TFE/PMVE、TFE/PMVE/E、TFE/P和TFE/P/VF2。  Preferred TFE-based fluorocarbon elastomer copolymers include TFE / PMVE, TFE / PMVE / E, TFE / P and TFE / P / VF2. 优选的VF2基氟烃弹性体共聚物包括VF2/HFP、VF2/HFP/TFE和VF2/PMVE/TFE。 Preferred VF2 based fluorocarbon elastomer copolymers include VF2 / HFP, VF2 / HFP / TFE and VF2 / PMVE / TFE. 这些弹性体共聚物中的任何一种还可包含固化点单体单元。 Any of these elastomer copolymers may further comprise cure site monomer units. 如本专利申请中所用，“链长”是指本发明方法中所用的含氟表面活性剂疏水末端中最长直链的原子数。  As used in this patent application, a "long chain" means hydrophobic end the method used in the present invention, a fluorine-containing surfactant is the longest straight chain of atoms. 除了表面活性剂疏水末端链中的碳以外，链长还包括诸如氧原子的原子，但是不包括最长直链的分叉，或不包括阴离子基团中的原子，例如不包括羧酸根中的碳。 In addition to the surfactant hydrophobic chain end carbon atom chain length further comprising an oxygen atom, such as, but not including the longest straight chain of bifurcation, or include atoms of the anionic group is, for example, is not included in carboxylate carbon. 如本专利申请中所用，“短链”是指长度不大于6的链。 As used in this patent application, a "short-chain" refers to a chain length of not greater than 6. “长链”是指长度大于6的链，例如链长为7至14个原子的含氟表面活性剂。 "Long chain" means a chain length greater than 6, for example a chain length of 7-14 atoms, fluorine surface active agent. 优选地，R1-On-L-的链长为3至6个原子。  Preferably, R1-On-L- chain length of 3 to 6 atoms. 根据本发明的一个优选形式，R1-On-L-的链长为4至6个原子。 According to a preferred form of the invention, R1-On-L- chain length of 4-6 atoms. 根据本发明的另一个优选形式，R1-On-L-的链长为3至5个原子。 According to another preferred form of the invention, R1-On-L- chain length of 3-5 atoms. 最优选地，R1-On-L-的链长为4至5个原子。 Most preferably, R1-On-L- chain length of 4-5 atoms. 通常，根据本发明，在相同条件下，所用表面活性剂具有的表面张力值显著高于全氟辛酸及其盐的表面张力值。  Generally, according to the present invention, under the same conditions, the surface tension of the surfactant having a value significantly higher than the surface tension of perfluorooctanoic acid and salts thereof. 由数均分子量为至少约800g/mol的氟聚醚酸或其盐与根据本发明所用的含氟表面活性剂的组合构成的聚合剂具有的表面张力显著低于单独使用的表面活性剂的表面张力。 The number average molecular weight of at least about surface fluoropolyether acid or salt thereof and the surface tension of a polymerization agent comprising the combination according to the fluorine-containing surfactant used in the present invention has a 800g / mol is significantly lower than the surface active agent used alone tension. 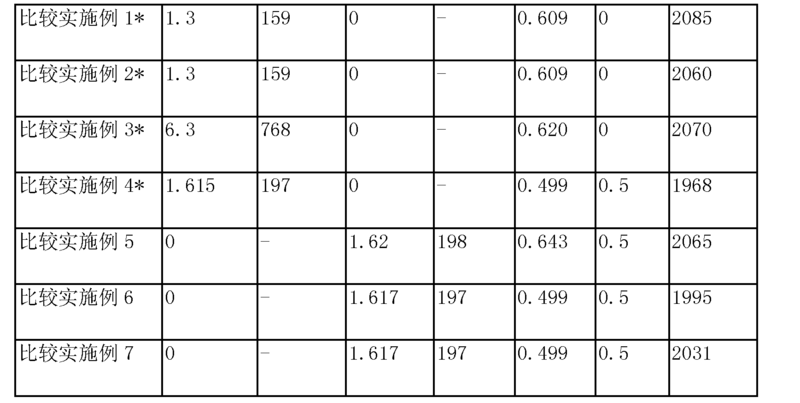 这示于下文的表面张力实施例表A中。 This is shown in the following Table A the surface tension of the embodiment. 根据授予Morgan等人的US6，395，848中的公开内容，该效果是令人惊奇的。 According to Morgan et al US6,395,848 granted in disclosure, the effect is surprising. Morgan等人公开的是，使用具有羧酸末端的全氟聚醚与表面活性剂6，2-TBS (链长为8个碳原子的表面活性剂)的组合，对表面张力具有很小的影响或没有影响。 Morgan et al., Disclosed that the carboxylic acid terminal having a perfluoropolyether surfactant 6,2-TBS (surfactant chain length of 8 carbon atoms), a combination of tension has little influence on the surface or no effect. 根据本发明的优选形式，用于所述方法中的包含含氟表面活性剂与氟聚醚的重量比率为5: I的聚合剂在6000ppm浓度和23°C下具有的水中表面张力比单独的含氟表面活性剂在6000ppm浓度和23°C下具有的水中表面张力低至少约30%。  According to a preferred form of the invention, the weight ratio of a fluorine-containing surfactant comprising fluoropolyether as the method 5: I polymeric agent having a concentration of 6000ppm at 23 ° C and surface tension of the water than the individual fluorine-containing surfactant having a concentration of 6000ppm at 23 ° C and a surface tension of at least about 30% water. L为选自-CX (R2)-的亚烷基，其中R2为氟或全氟甲基，并且X为氢或氟、和-CZ1Z2CZ3Z4-,其中Z1、Z2、Z3和Z4独立地选自氢或氟。  L is selected from -CX (R2) - alkylene group, wherein R2 is fluorine or perfluoromethyl and X is hydrogen or fluorine, and -CZ1Z2CZ3Z4-, wherein Z1, Z2, Z3 and Z4 are independently is selected from hydrogen or fluoro. 这种类型的氟醚酸和盐是已知的。  This type of fluoroether acids and salts are known. 当L为选自-CX(R2)-的亚烷基时，其中R2为氟或全氟甲基，并且X为氢或氟，所述化合物可经由例如全氟-2-烷氧基丙酰氟中间体的水解制得，如用于全氟(烷基乙烯基醚)制备中的授予Fritz和Selman的美国专利3，291，843中所公开，所述中间体可通过烷酰氟与六氟环氧丙烯的反应制得。 When L is selected from -CX (R2) - alkylene group, wherein R2 is fluorine or perfluoromethyl and X is hydrogen or fluorine, the compound may be via, for example perfluoro-2-alkoxy propionyl fluoro intermediates hydrolysis, such as a perfluoro (alkyl vinyl ether) prepared in Fritz granted U.S. Patent No. 3,291,843 and Selman disclosed, said intermediates by fluorine six alkanoyloxy fluoro-propylene oxide reaction system. 当L为-CZ2CZ2-时，其中Z独立地选自氢或氟，此类化合物的制备路线综述于美国专利2，713，593 (Brice等人)中，其中氟代(烷氧基丙)酸和衍生物可以通过电化学氟化作用以有效收率得自相应的烷氧基丙酸和衍生物。 When L is -CZ2CZ2-, wherein Z is independently selected from hydrogen or fluorine, route Summary preparation of such compounds in U.S. Patent No. 2,713,593 (Brice et al. ), Wherein the fluoro (alkoxyalkyl c) an acid and derivatives by electrochemical fluorination can be effective to yield available from the corresponding alkoxy derivatives and propionic acid. 可通过例如分馏来分离全氟化和部分氟化的产物。 The product can be isolated perfluorinated and partially fluorinated, for example, by fractional distillation. 对于部分氟化的丙氧基丙酰氟，可用的合成教导还可参见EP 0148 482 BI (Ohsaka等人)，其可通过电氟化酰基氟被进一步氟化或全氟化，然后易于转变成酸或盐。 For propoxylated partially fluorinated acid fluoride, available teachings synthesis see also EP 0148 482 BI (Ohsaka et al. ), Which may be further fluorinated or perfluorinated acid fluoride by electrophilic fluorination, and then readily converted into acid or a salt thereof. 如果Rl或L包含醚键，则根据本发明所用的含氟表面活性剂可以为二醚。  If Rl or L comprises an ether bond, a fluorine-containing surfactant used in the present invention may be a diether. 此类化合物可根据例如WO 01/46116 Al(Hintzer等人)中的教导来制得。 Such compounds can be, for example, WO 01/46116 Al (Hintzer et al.) Teaches be prepared. 优选的氟醚酸或盐是氟代单醚，其中R1和L不包含醚键。 Preferred fluoroether acids or salts is fluoro monoether, wherein R1 and L do not contain an ether bond. 根据本发明的另一个优选形式，式I中的R1为具有2至3个碳原子的直链的部分氟化或完全氟化的烷基。  According to another preferred form of the invention, R1 of formula I having a linear partially fluorinated 2-3 carbon atoms, or fully fluorinated alkyl group. 优选地，R1是完全氟化的。 Preferably, R1 is a fully fluorinated. 根据本发明的另一个优选形式，含氟表面活性剂是高度氟化的。  According to another preferred form of the invention, the fluorine-containing surfactant is highly fluorinated. “高度氟化”是指含氟表面活性剂中氟原子和氢原子总数的至少约50%是氟原子。 "Highly fluorinated" means that at least about 50% of the total number of fluorine atoms and hydrogen atoms in the fluorinated surfactant is a fluorine atom. 更优选地，含氟表面活性剂中的氟原子和氢原子总数的至少约75%是氟原子，最优选至少约90%是氟原子。 More preferably at least about 75%, the fluorine-containing surfactant of fluorine atoms and the total number of hydrogen atoms is a fluorine atom, and most preferably at least about 90% fluorine atoms. 根据本发明，还优选使用全氟化表面活性剂。 According to the present invention, it is also preferable to use perfluorinated surfactants. 其中Y+为氢、铵或碱金属阳离子。  wherein Y + is hydrogen, ammonium or alkali metal cation. 此为可由式I表示的化合物，其中R1为CF3CF2CF2- ；L为-CF(CF3)- ;A_是羧酸根；并且Y+为氢、铵或碱金属阳离子。 A compound represented by the formula I is this, wherein R1 is CF3CF2CF2-; L is -CF (CF3) -; A_ is carboxylate; and Y + is hydrogen, ammonium or alkali metal cation. 优选地，Y+为氢或铵。 Preferably, Y + is hydrogen or ammonium. 具有该化学式结构的化合物可得自全氟-2-丙氧基丙酰氟中间体，并且随后对于酸的情况，将所得酰基氟水解成羧酸，而对于盐的情况，通过同时或随后用适当的碱反应来制得所期望的盐，所述中间体可根据美国专利3，291，843或六氟环氧丙烯二聚来制备。 The compound having the structure of formula may be obtained from the perfluoro-2-propoxy propionyl fluoride intermediate, and then to an acid of the acyl fluoride resulting hydrolyzed to carboxylic acid, while in the case of a salt, by simultaneously or subsequently with reacting an appropriate base to obtain the desired salt, said intermediates can be prepared according to U.S. Patent No. 3,291,843 or poly hexafluoro propylene oxide II. 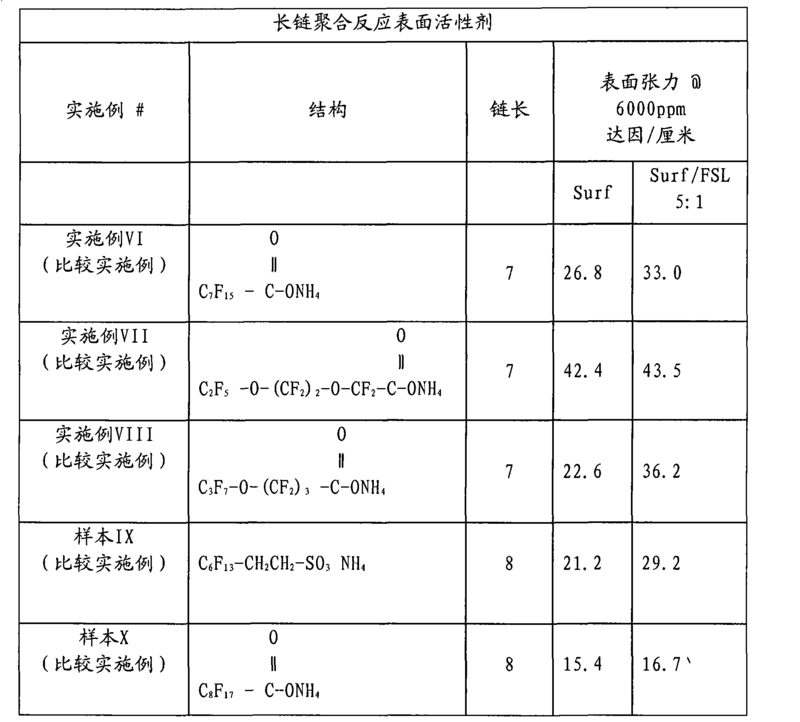 六氟环氧丙烯的二聚方法公开于大不列颠专利1292268中。 Hexafluoropropylene oxide propylene dimerization process is disclosed in British Patent No. 1,292,268 in. [CF3CF2OCF (CF3) COOl Y+ (III) 其中Y+为氢、铵或碱金属阳离子。  [CF3CF2OCF (CF3) COOl Y + (III)  wherein Y + is hydrogen, ammonium or alkali metal cation. 具有该化学式结构的化合物可得自全氟-2-乙氧基丙酰氟中间体，并且随后对于酸的情况，将所得酰基氟水解成羧酸，而对于盐的情况，通过同时或随后用适当的碱反应来制得所期望的盐，所述中间体可根据美国专利3，291,843 来制备。 The compound having the structure of formula may be obtained from the perfluoro-2-ethoxy-propionyl fluoride intermediate, and then to an acid of the acyl fluoride resulting hydrolyzed to carboxylic acid, while in the case of a salt, by simultaneously or subsequently with reacting an appropriate base to obtain the desired salt, said intermediates can be prepared according to U.S. Patent No. 3,291,843. 其中Y+为氢、铵或碱金属阳离子。  wherein Y + is hydrogen, ammonium or alkali metal cation. 具有该化学式结构的化合物可根据例如美国专利2，713，593 (Brice等人)中的教导来制备。 The compound having the chemical structure can be prepared, for example, according to U.S. Patent No. 2,713,593 (Brice et al.) Teaches. 其中Y+为氢、铵或碱金属阳离子。  wherein Y + is hydrogen, ammonium or alkali metal cation. 具有该式结构的表面活性剂可作为铵盐以商标N0VEC™4200从3M商购获得。  The surfactant having an ammonium salt structure may be used as the trademark N0VEC ™ 4200 available from 3M. 氟聚醚酸或盐. 用于本发明实践的聚合剂组合中的其它组分是氟聚醚酸或其盐。  fluoropolyether acids or salts. Other components of the polymerization agent combination used in the practice of the present invention is a fluoropolyether acid or salt thereof. 优选地，所述氟聚醚为全氟聚醚酸或其盐。 Preferably, the fluoropolyether is a perfluoropolyether acid or salt thereof. 氟聚醚酸或其盐中的酸性基团优选为选自羧酸、磺酸、磺酰胺、膦酸的酸性基团。 Fluoropolyether acid or salt thereof in the acidic group is preferably selected from carboxylic acid, sulfonic acid, sulfonamide, phosphonic acid acidic group. 在优选的实施方案中，氟聚醚酸或盐中的酸性基团为羧酸。 In a preferred embodiment, the fluoropolyether acid or salt group is a carboxylic acid. 在聚合反应期间，所述氟聚醚酸优选作为盐使用，最优选作为铵盐使用。 During the polymerization reaction, the fluoropolyether acid is preferably used as a salt, most preferably as ammonium salts. 根据本发明，优选的所用全氟聚醚(PFPE)酸或其盐可具有任何链结构，其中分子主链中的氧原子被具有1-3个碳原子的饱和氟烃基间隔。  According to the present invention, preferably used is a perfluoropolyether (the PFPE) acids or salts thereof may have any chain structure in which oxygen atoms in the backbone of the molecule is a saturated carbon atoms and 1-3 fluorine hydrocarbon interval. 在所述分子中，可存在不止一种类型的氟烃基。 In the molecule, there may be more than one type of fluorocarbon group. 这些结构论述于 Kasai 的“J.Appl.Polymer Sc1.”，57，797 (1995)中。  These structures are discussed in Kasai's "J.Appl.Polymer Sc1. ", 57,797 (1995) in. 如其中所公开，这种PFPE可在一个末端或两个末端处具有羧酸基团或其盐。 As disclosed therein, such PFPE can have a carboxylic acid group or salt thereof at one end or both ends. 类似地，这种PFPE可在一个末端或两个末端处具有磺酸或膦酸基团或其盐。 Similarly, such PFPE can have a sulfonic acid group or a phosphonic acid group or salt thereof at one end or both ends. 此外，在两个末端处均具有酸性官能团的PFPE可在每个末端具有不同的基团。 Further, at both ends each having an acidic functional group may PFPE having different groups at each end. 对于一官能PFPE，所述分子的另一末端通常被全氟化，但是可包含氢或氯原子。 For the PFPE monofunctional, the other end of the molecule is usually perfluorinated but may contain a hydrogen or chlorine atom. 可用于本发明的在一个或两个末端处具有酸性基团的PFPE具有至少2个醚氧,优选至少4个醚氧,并且甚至更优选至少6个醚氧。 PFPE may be used in the present invention has an acidic group at one or both ends having at least 2 ether oxygens, preferably at least 4 ether oxygens, and even more preferably at least 6 ether oxygens. 优选地,至少一个间隔醚氧的氟烃基团，并且更优选至少两个此类氟烃基团具有2或3个碳原子。 Preferably, the at least one spacer ether oxygens fluorocarbon groups, and more preferably at least two of such fluorocarbon groups having 2 or 3 carbon atoms. 甚至更优选地，间隔醚氧的氟烃基团中的至少50%具有2或3个碳原子。 Even more preferably, ether oxygen fluorocarbon groups spaced at least 50% having 2 or 3 carbon atoms. PFPE还优选具有共至少15个碳原子，例如上文重复单元结构中η或n+m的优选最小值为至少5。 PFPE preferably has a total of at least 15 carbon atoms, such as repeating unit structure above a minimum value preferably η or n + m is at least 5. 不止一种在一个或两个末端处具有酸性基团的PFPE可用于如本发明所述的方法中。 More than one PFPE having an acidic group at one or both ends can be used in the method of the present invention. 通常，除非投入特别的关注来制备个别特殊PFPE化合物，否则PFPE可在平均分子量附近的分子量范围内以不同比例包含多种化合物。 In general, unless special attention is prepared into individual special PFPE compound, or in different proportions PFPE may comprise a plurality of compounds in the molecular weight range around the average molecular weight. 氟聚醚酸或其盐具有的平均分子量能够使其与氟代单醚酸或盐组合用作如本发明方法中所述的聚合剂。  fluoropolyether acid or salt thereof having an average molecular weight can be allowed fluoro monoether in combination with an acid or salt used in the process of this invention as a polymerization agent. 根据本发明，所用的氟聚醚酸或盐的数均分子量大于约800g/mol。 According to the invention, the used fluoropolyether acids or salts of the number average molecular weight greater than about 800g / mol. 数均分子量大于约800g/mol的氟聚醚酸或盐在本专利申请中被定义为“聚合的氟聚醚”。 Number average molecular weight of greater than about 800g / mol of fluoropolyether acids or salts thereof are defined as "polymeric fluoropolyether" in the present patent application. 所用的氟聚醚酸或盐的数均分子量通常小于约6000g/mol，这是因为具有非常高分子量的氟聚醚酸或盐一般难以分散到含水聚合反应介质中。 Number fluoropolyether acid or salt thereof used is weight average molecular weight generally less than about 6000g / mol, because of having a very high molecular weight fluoropolyether acids or salts are typically difficult to disperse into the aqueous polymerization medium. 根据本发明所用的氟聚醚酸或其盐具有更优选约800至约3500g/mol，并且最优选1000至约2500g/mol的数均分子量。 Used according to the present invention having a fluoropolyether acids or salts thereof and more preferably from about 800 to about 3500g / mol, and most preferably from about 1000 to several 2500g / mol average molecular weight. 在本发明的优选实施方案的实践中，所述方法作为间歇方法在加压反应器中实施。  In the practice of a preferred embodiment of the present invention, the method as a batch process in a pressurized reactor embodiment. 适于实施本发明方法的垂直或水平式反应器配备用于含水介质的搅拌器以提供气相单体诸如TFE的充分接触，以获得所期望的反应速率，并且提供共聚单体(如果使用的话)的均匀掺入。 Suitable embodiment of the method of the present invention, a vertical or horizontal reactor equipped with a stirrer for the aqueous medium to provide sufficient contact of gas phase monomers such as TFE, to obtain the desired reaction rate, and to provide the comonomer (if used) uniform incorporation. 所述反应器优选包括围绕所述反应器的冷却夹套，以便可通过控温热交换介质的循环便利地调节反应温度。 The reactor preferably includes a cooling jacket surrounding the reactor so as to be circulating heat exchange medium temperature is easily adjusted by the reaction temperature. 在典型的方法中，首先向所述反应器中加入被称为聚合反应介质的去离子脱气水，并且将氟聚醚酸或盐和含氟表面活性剂分散到所述介质中。  In a typical process, deionized deaerated water is first referred to the polymerization medium in the reactor, and the fluoropolyether acid or salt and fluorosurfactant to the dispersion medium . 氟聚醚酸或盐和含氟表面活性剂的分散更详细地描述于下文中。 Fluoropolyether acid or salt and fluorosurfactant dispersing agent is described in more detail below. 对于PTFE均聚物和改性的PTFE，通常加入石蜡作为稳定剂。 For PTFE homopolymer and modified PTFE, paraffin wax is usually added as a stabilizer. 适用于PTFE均聚物和改性PTFE的方法包括首先用TFE使所述反应器增压。 The method is suitable for PTFE homopolymer and modified PTFE with TFE includes first pressurizing the reactor. 接着加入共聚单体(如果使用的话)，诸如HFP或全氟(烷基乙烯基醚)。 Followed by addition of the comonomer (if used), such as HFP or perfluoro (alkyl vinyl ether). 然后加入自由基引发剂溶液，诸如过硫酸铵溶液。 Then adding a free radical initiator solution such as ammonium persulfate solution. 对于PTFE均聚物和改性的PTFE，所述引发剂溶液中可存在第二引发剂以减少凝结物，所述第二引发剂为琥珀酸源，诸如过氧化二琥珀酰。 For PTFE homopolymer and modified PTFE, the initiator may be present in a second initiator solution to reduce coagulum was the second initiator is a source of succinic acid such as disuccinic acid peroxide. 作为另外一种选择，可使用氧化还原引发剂体系，诸如高锰酸钾/草酸。 Alternatively, a redox initiator system such as potassium permanganate / oxalic acid. 温度升高，并且在聚合反应开始后，加入额外的TFE以保持压力。 Temperature, and after the start of the polymerization reaction, additional TFE is added to maintain the pressure. 聚合反应的开始被称为起始点，并且被定义为观察到气态单体给料压力显著降低例如约IOpsi (约70kPa)的时刻。 The beginning of polymerization is referred to as the starting point, and is defined as the observed gaseous monomer feed pressure is significantly reduced in time, for example, from about IOpsi (about 70kPa) a. 随着聚合反应的进行，还可加入共聚单体和/或链转移剂。 As the polymerization reaction proceeds, may also be added comonomer and / or chain transfer agent. 对于某些聚合反应，可在聚合反应期间加入额外的单体、引发剂和/或聚合剂。 For some polymerizations, additional monomers may be added during the polymerization reaction, the initiator and / or polymeric agents. 间歇分散聚合反应可被描述成分两个阶段进行。  The batch dispersion polymerization component can be described in two phases. 反应初期可以说是成核阶段，期间形成一定数量的颗粒。 The initial reaction can be said that the nucleation stage, a certain number of particles period. 随后可以说进行到生长阶段，期间主要行为是单体在已形成的颗粒上发生聚合反应，而形成很少的新的颗粒或不形成任何新的颗粒。 Then it can be said to the growth stage, acts mainly during the polymerization of the monomer is occurring on the particles already formed, to form new particles or less without forming any new particle. 聚合反应从成核阶段至生长阶段的转变是平稳发生的，对于TFE的聚合反应，通常介于约4%至约10%固体。 Polymerization from the nucleation stage is the growth stage to transition occurs smoothly, for the polymerization of TFE, typically between about 4% to about 10% solids. 在间歇分散聚合反应完成后(通常若干小时)，当已获得期望量的聚合物或固体含量时，停止给料，放空反应器并且用氮气吹扫，并且将所述容器中的粗分散体转移至冷却容器中。  After completion of the reaction the dispersion polymerization (typically several hours) in a batch, when the polymer or solids content has been obtained in a desired amount, the feeds are stopped, the reactor is vented and purged with nitrogen, the vessel and the crude dispersion was transferred to a cooling vessel. 聚合反应完成时分散体中的固体含量可根据分散体的预期用途而不同。  Upon completion of the polymerization the solid content of the dispersion may vary depending on the intended use of the dispersion. 例如，本发明的方法可用于制备具有较小固体含量例如小于10%的“晶种”分散体，其可用作随后聚合反应过程的“晶种”以获得更高的固体含量。 For example, the method of the present invention may be used for preparing e.g. having a solids content of less than 10% of the "seed" dispersion "seed" which can be used in the subsequent polymerization process to a higher solids content. 在其它方法中，由本发明方法获得的含氟聚合物分散体固体含量优选为至少约10重量％。 In other methods, a fluorine-containing polymer obtained by the process of the present invention, the solid content of the dispersion is preferably at least about 10% by weight. 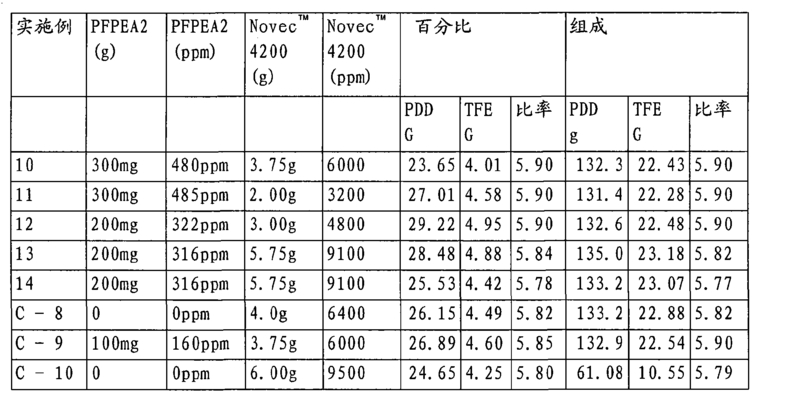 所述含氟聚合物固体含量更优选为至少约20重量％。 The fluoropolymer solids content is more preferably at least about 20% by weight. 由所述方法获得的含氟聚合物固体含量的优选范围为约20重量％至约65重量％，甚至更优选约20重量％至约55重量％，最优选约35重量％至约55重量％。 The preferred range of solids content of the fluoropolymer obtained by the method is from about 20 wt% to about 65 wt%, even more preferably about 20 wt% to about 55 wt%, most preferably from about 35% to about 55 wt% . 在本发明的一个优选方法中，按所制得的含氟聚合物的总重量计，聚合产生小于约10重量％ ,更优选小于3重量％ ,甚至更优选小于I重量％，最优选小于约0.5重量％的未分散的含氟聚合物(凝结物)。  In a preferred method of the present invention, the total weight of the obtained fluorine-containing polymer, polymerization of less than about 10 wt%, more preferably less than 3 wt%, and even more preferably less than I wt%, most preferably less than about 0.5% by weight undispersed fluoropolymer (coagulum). 聚合分散体可用阴离子、阳离子或非离子表面活性剂稳定以用于某些用途。 -polymerized dispersion can be anionic, cationic or nonionic surfactant stabilizer for certain uses. 然而通常将聚合分散体转移到分散体浓缩操作过程中，所述操作通过已知方法可制得通常用非离子表面活性剂稳定的浓缩分散体。 However, in general polymeric dispersion was transferred to a dispersion concentration operation process, the operation can be prepared by known methods commonly used non-ionic surfactant-stabilized concentrated dispersions. 浓缩分散体的固体含量通常为约35至约70重量％。 Concentrated dispersion of solids content is typically from about 35 to about 70 wt%. 制备某些等级的PTFE分散体以形成精细粉末。 Preparation of certain grades of PTFE dispersion to form a fine powder. 为此用途，将分散体凝结，除去含水介质，并且使PTFE干燥以产生精细粉末。 For this use, the dispersion is coagulated, the aqueous medium was removed and dried to produce the PTFE fine powder. 可熔融加工的共聚物的分散聚合反应是类似的，不同的是初始时将显著量的共聚单体加入到批料中和/或在聚合反应期间掺入。  The dispersion polymerization of melt-processible copolymers is similar except that comonomer in significant quantity is added to the batch and / or incorporated during the initial polymerization reaction. 通常使用显著量的链转移剂以降低分子量以增加熔融流动速率。 Usually a significant amount of chain transfer agent to reduce the molecular weight to increase melt flow rate. 可使用相同的分散体浓度来制得稳定的浓缩分散体。 Using the same concentration of the dispersion used to produce stabilized concentrated dispersions. 作为另外一种选择，对于可用作模制树脂的可熔融加工的氟聚合物，使分散体凝结并且除去含水介质。 Alternatively, for melt-processible fluoropolymers used as molding resin, the dispersion coagulated and the aqueous medium is removed. 然后干燥含氟聚合物，接着加工成便利形式诸如薄片、碎片或小丸，以用于后续熔融加工操作中。 The fluorine-containing polymer was then dried, and then processed into a convenient form such as flake, chip or pellet for use in subsequent melt processing operations. 本发明的方法也可作为连续方法在加压反应器中实施。  The method of the present invention can also be implemented in a pressurized reactor as a continuous process. 连续方法尤其可用于制备氟烃弹性体。 Continuous process is especially useful for the preparation of fluorocarbon elastomers. 根据本发明，聚合反应使用在聚合反应条件下能够产生自由基的自由基引发剂。  According to the invention, capable of generating free radical polymerization using a radical polymerization initiator under the reaction conditions. 如本领域所熟知，根据含氟聚合物的类型和期望获得的特性例如端基类型、分子量等来选择用于本发明的引发剂。 As known in the art, depending on the type and characteristics of the obtained fluorine-containing polymer, for example, the desired end group type, molecular weight, etc. choice of initiator used in the present invention. 对于某些氟聚合物诸如可熔融加工的TFE共聚物，使用可在聚合物中产生阴离子端基的无机过酸的水溶性盐。 For some fluoropolymers such as TFE copolymer can be melt-processable, water-soluble salts may be generated using an inorganic peracid anionic end groups in the polymer. 此类优选的引发剂具有较长的半衰期，优选过硫酸盐，例如过硫酸铵或过硫酸钾。 Such preferred initiators having longer half-life, preferably persulfates, e.g., ammonium persulfate or potassium persulfate. 为缩短过硫酸盐引发剂的半衰期，可使用还原剂诸如亚硫酸氢铵或偏亚硫酸氢钠，而无论是否存在金属催化剂盐诸如Fe。 To shorten the half-life of persulfate initiators, reducing agents may be hydrogen, ammonium bisulfite, sodium metabisulfite or sulfite such, regardless of whether metal catalyst salts such as Fe. 优选的过硫酸盐引发剂基本上不含金属离子，并且最优选的是铵盐。 Preferred persulfate initiators are substantially free of metal ions, and most preferably are ammonium salts. 为了制备用于分散体最终用途的PTFE或改性PTFE分散体，除了较长半衰期的引发剂诸如过硫酸盐以外，还优选加入少量短链二羧酸诸如琥珀酸或产生琥珀酸的引发剂诸如过氧化二琥珀酸(DSP)。  To prepare for the end use of the dispersion of PTFE or modified PTFE dispersion, in addition to the longer half-life initiators such as a persulfate, preferably also small amounts of short chain dicarboxylic acids such as succinic acid or a succinic initiator such as disuccinic acid peroxide (DSP). 此类短链二羧酸通常有益于减少未被分散的聚合物(凝结物)。 Such short chain dicarboxylic acids typically beneficial in reducing undispersed polymer (coagulum). 为制备用于生产精细粉末的PTFE分散体，通常使用氧化还原引发剂体系，诸如高锰酸钾/草酸。 To prepare for the production of fine powder PTFE dispersion, typically a redox initiator system such as potassium permanganate / oxalic acid. 将足量引发剂加入到含水聚合反应介质中以弓丨发聚合反应，并且使聚合反应保持所期望的反应速率。  A sufficient amount of the polymerization initiator is added to the aqueous reaction medium to initiate polymerization bow Shu, and the polymerization reaction to maintain the desired reaction rate. 在聚合反应开始时，优选加入至少一部分引发剂。 At the start of the polymerization reaction, preferably at least a portion of the initiator was added. 可使用多种加入模式，包括在整个聚合反应期间连续加入，或在聚合反应期间的预定时刻定量或间歇加入。 A variety of modes can be used including continuously throughout the polymerization reaction, or a predetermined timing doses or intervals during the polymerization reaction. 尤其优选的操作模式是将引发剂预先加入到反应器中，并且随着聚合反应的进行，将额外的引发剂连续加入到反应器中。 Especially preferred mode of operation is for initiator previously added to the reactor, and with the progress of the polymerization reaction, additional initiator is continuously added to the reactor. 优选地，按所述含水介质的重量计，聚合反应期间所用的过硫酸铵和/或过硫酸钾的总量为约25ppm至约250ppm。 Preferably, by weight of the aqueous medium used during the polymerization reaction of ammonium persulfate and / or potassium persulfate total amount of about 25ppm to about 250ppm. 可以本领域已知的量并且根据本领域已知的方法使用其它类型的引发剂，例如高锰酸钾/草酸引发剂。 This amount may be known in the art and the use of other types of initiators according to methods known in the art, such as potassium permanganate / oxalic acid initiators. 对于某些类型的聚合物例如可熔融加工的TFE共聚物的聚合反应，可在如本发明所述的方法中使用链转移剂来降低分子量，以达到调节熔融粘度的目的。  For certain types of polymers such as polymerization of melt-processible TFE copolymers, may be used as chain transfer agents in the process according to the present invention is to reduce the molecular weight to achieve the purpose of adjusting melt viscosity. 可用于此目的的链转移剂熟知可用于氟化单体聚合反应。 Useful for this purpose are well known chain transfer agents can be used in the polymerization of fluorinated monomers. 优选的链转移剂包括氢、具有I至20个碳原子、更优选I至8个碳原子的脂族烃、卤代烃、含氢卤代烃或醇。 Preferred chain transfer agents include hydrogen, having I to 20 carbon atoms, more preferably aliphatic hydrocarbons I to 8 carbon atoms, a halogenated hydrocarbon, a hydrogen-containing halogenated hydrocarbon or an alcohol. 此类链转移剂的代表性实例是烷烃，诸如乙烷、氯仿、I，4- 二碘全氟丁烷和甲醇。 Representative examples of such chain transfer agents are alkanes, such as ethane, chloroform, I, 4- diiodo perfluorobutane and methanol. 链转移剂的量和加入模式取决于具体链转移剂的活性以及所期望的聚合物产品分子量。  The amount of chain transfer agent and the mode of addition depend on the activity of the particular chain transfer agent and the desired molecular weight of the polymer product. 可使用多种加入模式，包括在聚合反应开始之前一次性加入，在整个聚合反应期间连续加入，或在聚合反应期间的预定时刻定量或间歇加入。 A variety of modes can be used, including addition of the polymerization reaction before the start-time, continuously added throughout the polymerization, or a predetermined timing doses or intervals during the polymerization reaction. 按所得含氟聚合物的重量计，加入到聚合反应反应器中的链转移剂的量优选为约0.005至约5重量％，更优选约0.01至约2重量％。 By weight of the obtained fluoropolymer, the amount of chain transfer agent added to the polymerization reaction in the reactor is preferably from about 0.005 to about 5 wt%, more preferably about 0.01 to about 2 wt%. 根据本发明，优选使氟聚醚酸或其盐和含氟表面活性剂充分分散在含水介质中以有效地用作聚合剂。  According to the present invention, it is preferable that the fluoropolyether acid or salt thereof and a fluorine-containing surfactant is well dispersed in an aqueous medium to effectively as a polymerization agent. 如此专利申请所用，如果其中氟聚醚酸或盐和/或含氟表面活性剂可溶解于含水介质，则“分散的”是指溶解，或者如果氟聚醚酸或盐和/或含氟表面活性剂不完全溶解并且以极小颗粒形式例如约Inm至约Ιμπι存在于含水介质中，则“分散的”是指分散。 As used herein, such patent, wherein if the fluoropolyether acids or salts and / or fluorine-containing surfactant is soluble in aqueous media, "dispersion" means dissolves, or if the fluoropolyether acids or salts and / or fluorine-containing surface and the active agent is not completely dissolved in the form of very small particles, for example, from about Inm to about Ιμπι present in the aqueous medium, the "dispersion" means a dispersion. 类似地，如此专利申请所用，“分散”是指溶解或分散氟聚醚酸或盐和/或含氟表面活性剂，以便它们如上所定义被分散。 Similarly, such patent application, a "dispersion" refers to a dissolved or dispersed fluoropolyether acid or salt and / or a fluorine-containing surfactant, so that they are dispersed as defined above. 氟聚醚酸或盐和含氟表面活性剂优选被充分分散，以便包含氟聚醚酸或盐和含氟表面活性剂的聚合反应介质呈无色透明或近似无色透明。 Fluoropolyether acid or salt and fluorosurfactant are preferably sufficiently dispersed so as comprising fluoropolyether acid or salt and fluorosurfactant polymerization medium or almost colorless and transparent colorless and transparent. 更优选地，在下文测试方法中，调节至包含1500ppm土IOOppm氟聚醚酸或盐的分散的氟聚醚酸盐和含氟表面活性剂的水浓缩液具有小于约10%，并且最优选小于约7%的雾度。 More preferably, in the test method below, adjusting the water to a concentrated solution comprising 1500ppm soil IOOppm fluoropolyether acids or salts dispersed fluoropolyether acid and fluorosurfactant is less than about 10%, and most preferably less than about 7% of haze. 分散的氟聚醚酸或盐水浓缩液雾度的优选范围为约O至约10%。 Dispersed fluoropolyether acid or salt solution preferably range haze concentrated to from about O to about 10%. 分散的氟聚醚酸或盐在1500ppm± IOOppm下具有的低雾度值与含水聚合反应过程中聚合剂的性能相关。  dispersed fluoropolyether acids or salts having at ± 1500ppm IOOppm in a low haze value and aqueous polymerization during the polymerization reaction performance-related agent. 例如，与具有较高雾度值的浓缩液相比，聚合反应使用较低雾度的浓缩液产生更少的非分散聚合物(凝结物)。 For example, in comparison with a concentrate having a higher haze value, the polymerization reaction solution was concentrated using a low haze produced less non-dispersed polymer (coagulum). 通常，此类浓缩液中含氟表面活性剂的浓度不像氟聚醚酸或盐那样会显著影响雾度值，因此使用1500ppm± IOOppm浓度的分散的氟聚醚酸或盐来进行雾度测定，而不是在包含氟聚醚酸或其盐和含氟表面活性剂的聚合剂的选定浓度下进行雾度测定。 Typically, a concentration of not fluoropolyether acids or salts of such fluorine-containing concentrate surfactant that would significantly affect the haze value, a dispersing concentration of 1500ppm ± IOOppm fluoropolyether acids or salt in a measuring haze rather than the haze measured at a selected concentration of fluoropolyether acid or salt thereof comprising a fluorine-containing surfactant and a polymerization agent. 由于氟聚醚盐含量低，因此包含分散氟聚醚盐的含水聚合反应介质的自身雾度值对由氟聚醚盐贡献的雾度较不敏感，但是可能被含水聚合反应介质中的其它组分影响。 Due to the low salt content fluoropolyether, thus comprising an aqueous dispersion of the haze value itself fluoropolyether salt polymerization medium is not sensitive to the haze contributed by the more fluoropolyether salt, but other groups may be aqueous polymerization reaction medium the impact points. 氟聚醚酸或其盐和含氟表面活性剂的分散可以多种方法实施。  Various methods may be implemented in dispersed fluoropolyether acid or salt thereof and a fluorine-containing surfactant. 在一种适宜的方法中，聚合剂可直接在含水聚合反应介质中制得。 In one suitable method, the polymerization agent directly in the aqueous polymerization medium was prepared. 在该方法中，氟聚醚酸或盐以酸的形式提供，随后可转变成盐形式。 In this method, provided fluoropolyether acids or salts in the acid form, it may then be converted to a salt form. 这可通过首先将足量的氢氧化铵或碱金属氢氧化物(优选氢氧化铵)加入到含水聚合反应介质中，以将随后加入的氟聚醚酸基本上完全转变成盐形式。 This can first be a sufficient amount of ammonium hydroxide or an alkali metal hydroxide (preferably ammonium hydroxide) was added to the aqueous polymerization medium, followed by addition to the fluoropolyether acids substantially completely converted to salt form by. 然后可将氟聚醚酸加入到氢氧化铵或碱金属氢氧化物溶液中，并且如果需要，可进行PH测量，以确定碱是否使用不足或过量。 Fluoropolyether acid can then be added to ammonium hydroxide or an alkali metal hydroxide solution and, if necessary, PH may be measured to determine whether the deficiency or excess of the base. 此外，如本领域所已知，氢氧化铵或碱金属氢氧化物的用量连同加入到聚合反应介质的其它物质应在含水聚合反应介质中提供一定的PH，其可适宜程度地提高所用具体引发剂体系的活性，并且提供聚合剂可操作的PH范围。 Further, as known in the art, the amount of ammonium hydroxide or an alkali metal hydroxide is added to the polymerization medium along with the other materials should provide a polymerization medium in the aqueous PH, which may improve the suitability of a particular initiator used surfactant system, and operable to provide a polymerization agent PH range. 可在氟聚醚酸加入之前、与氟聚醚酸加入同时或在氟聚醚酸加入之后，将含氟表面活性剂加入到含水聚合反应介质中。 Fluoropolyether acids may be added prior to, simultaneously with or fluoropolyether acid is added after addition of perfluoropolyether acids, fluorine-containing surfactant is added to the aqueous polymerization medium. 根据本发明方法的一个优选形式，制备聚合剂的方法采取制备分散的氟聚醚酸或盐和含氟表面活性剂的水浓缩液，随后将其加入到较大体积的含水聚合反应介质中。  According to a preferred form of the method of the present invention, a polymerization process for preparing the preparation of the dispersion agent take fluoropolyether acid or salt and a fluorine-containing aqueous concentrate of a surfactant, then added to a larger volume of the aqueous polymerization media. 可通过使氟聚醚酸与小体积氢氧化铵或碱金属氢氧化物水溶液反应以制得包含盐形式氟聚醚酸的浓缩液来制备所述浓缩液。 It can be prepared in the form of a salt concentrate comprising fluoropolyether acid by reacting fluoropolyether acid with a small volume of ammonium hydroxide or an alkali metal hydroxide solution to prepare the reaction solution was concentrated. 然后将所述表面活性剂加入到优选为铵盐或碱金属盐形式的所述浓缩液中。 And then the surfactant is added to alkali metal salt or an ammonium salt is preferably in the form of the concentrate. 作为另外一种选择，在表面活性剂的存在下，进行氟聚醚酸与小体积氢氧化铵或碱金属氢氧化物水溶液反应来制得所述浓缩液。 Alternatively, in the presence of a surfactant, a small volume of fluoropolyether acid with aqueous ammonium hydroxide or an alkali metal hydroxide to produce said concentrate. 然后将适量的分散的氟聚醚酸或盐和含氟表面活性剂的浓缩液混入到含水聚合反应介质中，以所期望量提供已被分散的氟聚醚酸或盐和含氟表面活性剂。  Then an appropriate amount of the dispersed fluoropolyether acid or salt thereof, and the concentrate is mixed fluorinated surfactant to the aqueous polymerization medium to provide the desired amount has been dispersed fluoropolyether acid or salt and a fluorine-containing Surfactant. 用于制备浓缩液的氢氧化铵或碱金属氢氧化物的量应在含水聚合反应介质中提供一定的PH，其可适宜程度地提高所用具体引发剂体系的活性，并且提供聚合剂可操作的PH范围。 The amount of ammonium hydroxide or alkali metal hydroxide used for preparing the concentrate should provide a PH in the aqueous polymerization medium, which can be suitably improved extent on the specific active agent initiator system and operable to provide a polymerization agent PH range. 在本发明的一种优选形式中，使用分散助剂，通过使氟聚醚酸或盐与所述分散助剂接触，来辅助所述酸或盐的分散。  In one preferred form of the invention, a dispersing aid, by making contact with the dispersing aid, to assist in dispersing the acid or salt fluoropolyether acids or salts. 分散助剂尤其可用于分散较高分子量的氟聚醚酸或其盐，例如分子量高于约1200g/mol。 Dispersing aid is particularly useful for higher molecular weight dispersed fluoropolyether acid or salt thereof, e.g. a molecular weight of greater than about 1200g / mol. 分散助剂可用于上述方法中以分散氟聚醚酸或盐，即分散到聚合反应介质中或分散到浓缩液中。 Dispersing aids used in the above process may be dispersed fluoropolyether acid or salt thereof, i.e., dispersed in the polymerization medium or dispersed in the concentrate. 优选在将氟聚醚酸或盐分散到浓缩液含水介质中之前使氟聚醚酸或盐与分散助剂接触。 Preferably so fluoropolyether acid or salt with dispersing aid prior to contacting the fluoropolyether acids or salts dispersed in an aqueous medium in the concentrate. 含氟表面活性剂可在氟聚醚酸或盐被分散之后加入。 The fluorine-containing surfactant may be added after the fluoropolyether acid or salt is dispersed. 可使用多种分散助剂中的任何一种以有助于分散如本发明所用的氟聚醚酸或盐。  using any of a variety of dispersing aid to facilitate dispersing fluoropolyether acids or salts as used in the present invention. 表面活性剂，优选将被用于聚合反应中的含氟表面活性剂，可用来分散氟聚醚酸或盐。 A surfactant, preferably to be used for the polymerization reaction in a fluorine-containing surfactant, can be used to disperse the fluoropolyether acids or salts. 一般来讲，并且尤其是当聚合高分子量含氟聚合物时，优选低调聚型或非调聚型分散助剂。 Generally, and especially when a high molecular weight polymeric fluorine-containing polymer, preferably polyethylene or non-low-telogenic dispersing aid. 对于某些分散助剂，希望在加入到含水聚合反应介质中之前或加入到形成浓缩液的含水介质中之前，使分散助剂与氟聚醚酸或盐混合。 For some dispersing aids, before the desired reaction medium or added to the aqueous polymerization medium prior to formation of the aqueous concentrate is added to the mixed dispersion aid polyether acids or salts with fluoro. 一类适宜的分散助剂包括C3-C8醇，尤其适宜的分散助剂是叔丁醇。  One class of suitable dispersing aids include C3-C8 alcohols, particularly suitable dispersing aids are t-butanol. 当氟聚醚酸或盐以酸形式提供并且铵盐将用于聚合剂中时，可通过同时混合氟聚醚酸、叔丁醇和氢氧化铵水溶液并且搅拌来形成浓缩液。 When the fluoropolyether acids or salts and ammonium salts of the acid form provides the agent for polymerization, the stirring and can be formed by simultaneously mixing the concentrate fluoropolyether acid, tert-butanol and aqueous ammonium hydroxide. 随后可加入氟代单醚酸或盐以形成有效的聚合剂组合。 It may then be added monoether fluoro acids or salts to form an effective combination of a polymerization agent. 优选地，叔丁醇的加入量为氟聚醚酸重量的约0.5倍至约3倍，然而优选使用最低有效量以降低调聚作用。 Preferably, the amount of t-butanol was added was about 0.5 times the weight of the fluoropolyether acids to about 3 times, however, it preferred to use the minimum effective amount to reduce low-dimerization. C3至C8醇诸如叔丁醇一般不用于PTFE或改性PTFE的聚合反应，这是因为它们的调聚活性可能会影响获得通常期望的高分子量。 C3 to C8 alcohol, such as t-butanol are generally not used in the polymerization of PTFE or modified PTFE, which because of their telogenic activity may affect the desired molecular weight is usually obtained. 在一些情况下，希望水存在于C3-C8醇中，即，使用醇/水混合物，以有效地分散氟聚醚酸或盐。 In some cases, desirable water is present in C3-C8 alcohol, i.e. an alcohol / water mixture, in order to effectively disperse fluoropolyether acids or salts. 根据本发明的另一种优选形式，氟聚醚酸或盐以酸形式提供，并且待用表面活性剂同样也以酸形式提供(式I中的Y+为H)。  According to another preferred form of the invention, provided fluoropolyether acids or salts in acid form, and stand also provides a surfactant (Formula I is Y + is H) in acid form. 已发现，酸形式的氟聚醚酸和含氟表面活性剂将形成易于分散到含水介质(即含水聚合反应介质或水溶液)中的混合物，以制得浓缩液。 It has been found, the acid form of fluoropolyether acid and fluorosurfactant mixture formed readily dispersed in aqueous medium (i.e. aqueous or aqueous polymerization medium) in order to obtain a concentrate. 此外，甚至是在氟聚醚羧酸具有高分子量并且可能另外需要分散助剂时，酸混合物仍易于分散。 Further, even in a high molecular weight perfluoropolyether carboxylic acids and may additionally needed a dispersing aid, the acid mixture remains readily dispersible. 该优选方法尤其可用于制备PTFE或改性的PTFE，其中分散助剂诸如叔丁醇的调聚作用可能使其难以获得所期望的高分子量，并且将不利地影响蜡的使用。 The preferred method is particularly useful for the preparation of PTFE or modified PTFE, wherein the dispersing aid such as t-butanol telogenic effect may make it difficult to obtain the desired molecular weight, and will adversely affect the use of the wax. 在本发明的这种优选的形式中，在加入到含水聚合反应介质或浓缩液中之前，将酸形式的氟聚醚酸和含氟表面活性剂混合在一起以形成酸混合物。 In this preferred form of the present invention, prior to addition to the aqueous polymerization medium or concentrate, the acid form of fluoropolyether acid and fluorosurfactant to form an acid mixture are mixed together. 氟聚醚酸和含氟表面活性剂的混合物优选包含小于约50重量％的水。 The mixture of fluoropolyether acids and fluorine-containing surfactant preferably comprises less than about 50% by weight of water. 在本发明的一种使用盐形式聚合剂的优选形式中，使此酸混合物接触氢氧化铵或碱金属氢氧化物。 In a preferred form of using a salt form of the agent for polymerization of the present invention, so that the acid mixture is contacted with ammonium hydroxide or alkali metal hydroxides. 更优选地，使此混合物接触氢氧化铵水溶液，以形成铵盐形式的分散氟聚醚盐和含氟表面活性剂。 More preferably, this mixture contacting aqueous ammonium hydroxide to form ammonium salt in the form of dispersed fluoropolyether and the fluorinated surfactant. 在本发明的一种优选形式中，通过在聚合反应介质中提供氢氧化铵或碱金属氢氧化物并且将酸混合物混合到聚合反应介质中来实现酸混合物与氢氧化铵或碱金属氢氧化物的接触，以将氟聚醚酸和含氟表面活性剂的盐分散到聚合反应介质中。 In a preferred form of the invention, the acid and the mixture was mixed by providing ammonium hydroxide or an alkali metal hydroxide in the polymerization reaction medium to the polymerization medium to achieve a mixture with an acid or an alkali metal hydroxide, ammonium hydroxide contacting, to the fluorine-containing acid and a salt fluoropolyether surfactant dispersion to the polymerization reaction medium. 在所述方法的另一种优选形式中，使用含水氢氧化铵或含水碱金属氢氧化物形成由氟聚醚酸和含氟表面活性剂的分散盐构成的水浓缩液，来实现酸混合物与氢氧化铵或碱金属氢氧化物的接触。 In another preferred form of the method, the use of aqueous ammonium hydroxide or aqueous alkali metal hydroxide to form water dispersible concentrates composed of a fluorine-containing acid, and salts of perfluoropolyether surfactant, the acid mixture to achieve contacting an ammonium hydroxide or alkali metal hydroxide. 将水浓缩液加入到含水聚合反应介质中以将氟聚醚酸和含氟表面活性剂的盐分散到聚合反应介质中。 The aqueous concentrate was added to the aqueous polymerization medium to acid and salt fluoropolyether fluorinated surfactant is dispersed in the polymerization medium. 为了制备包含分散的氟聚醚酸或盐和含氟表面活性剂的浓缩液，优选使用含水氢氧化铵或含水碱金属氢氧化物溶液。  For the preparation of fluoropolyether acids or salts and concentrate the fluorinated surfactant containing dispersed, preferably using an aqueous ammonium hydroxide or aqueous alkali metal hydroxide solution. 铵盐优选用于本发明的实践中，因此优选使用含水氢氧化铵。 Preferred salts used in the practice of the present invention, it is preferable to use an aqueous ammonium hydroxide. 所用含水氢氧化铵优选地具有约15至约40重量％的氨含量。 Has an ammonia content from about 15 to about 40% by weight aqueous ammonium hydroxide preferred. 为了有利于制备聚合剂浓缩液，有时希望首先制备具有非常高聚合剂含量的浓缩液，例如5000至500，OOOppm的分散的氟聚醚酸或盐。  In order to facilitate the preparation of a polymerization agent concentrate, sometimes desirable to concentrate was first prepared having a very high content of polymeric agents, e.g. 5000-500, OOOppm dispersed fluoropolyether acid or salt thereof. 虽然该“超浓缩液”可被直接掺入到聚合反应介质中，但是优选首先用适量(10至100体积)的水稀释，以制得可向含水聚合反应介质提供分散聚合剂的浓缩液。 Although the "super-concentrates" may be incorporated directly into the polymerization medium, but is preferably first diluted with an appropriate amount (10 to 100 vol) in water, to obtain a polymerizable reaction medium to provide the concentrated solution to the aqueous dispersion polymerization agent. 在将超浓缩液加入到稀释水中时，优选将水剧烈搅拌，并且通过高剪切点处滴加或通过浸没在搅拌水中的毛细管或小直径管缓慢加入浓缩液。 When super concentrate was added to the dilution water, preferably water with vigorous stirring, and added dropwise with stirring by immersion in water or a capillary tube or a small diameter by slow addition of concentrated solution at a high shear point. 如果将未稀释的超浓缩液加入到聚合反应容器中，则优选应类似地在剧烈搅拌下，逐渐将水加入到聚合反应容器中。 If the super concentrated undiluted solution was added to the polymerization vessel, it is preferable to be similarly vigorous stirring, water was added gradually to the polymerization vessel. 剧烈搅拌在制备聚合剂浓缩液和加入到含水聚合反应介质中的所有阶段一般都是适宜的。 Was stirred vigorously in the preparation of a polymerization agent concentrate and added to the aqueous polymerization medium in all the stages are generally suitable. 如本发明所用的优选水浓缩液包含约I至约95重量％的水，最优选约50至约95重量％的水。  The preferred aqueous concentrate used in the present invention comprise from about I to about 95 wt% water, and most preferably from about 50 to about 95 wt% water. 优选地，所述水浓缩液包含约0.5至约50重量％的分散的氟聚醚酸或盐。 Preferably, said aqueous concentrate comprises from about 0.5 to about 50 wt% dispersed fluoropolyether acid or salt thereof. 优选的浓缩液在室温下是稳定的，即此类浓缩液可在室温下保持至少一周，而不会有任何显著量的氟聚醚酸或盐和含氟表面活性剂从所述浓缩液中分离出来。 Preferred concentrates are stable at room temperature, i.e., such a concentrate may be at least one week at room temperature, without any significant amount of fluoropolyether acid or salt and fluorosurfactant from the concentrated solution separate from. 在本发明的一个优选形式中，如本发明所用的聚合剂包含按重量计较大量的含氟表面活性剂和按重量计较小量的氟聚醚酸或其盐。  In a preferred form of the invention, as the polymerization agent used in the present invention comprises a large number of care by weight fluorinated surfactant and a small amount of care by weight fluoropolyether acid or salt thereof. 更优选地，所述含氟表面活性剂构成所述聚合剂的至少约55重量％，最优选至少约65重量％。 By weight of at least about 55 More preferably, the fluorinated surfactant constituting the polymerizer%, most preferably at least about 65% by weight. 本发明的这种形式可用于多种氟聚合物，但是尤其可用于共聚单体含量不大于约I重量％的PTFE或改性PTFE的聚合反应。 This form of the invention can be used in a variety of fluoropolymers, but are particularly useful for the comonomer content is no greater than about I wt%, the polymerization of PTFE or modified PTFE. 在本发明的另一种优选形式中，聚合剂包含较大量的所述氟聚醚酸或其盐和较小量的含氟表面活性剂。 In another preferred form of the invention, the polymerization agent comprises a relatively large amount of fluoropolyether acid or salt thereof and a smaller amount of fluorinated surfactant. 本发明的这种形式可用于可熔融加工的共聚物，诸如包含至少约60至98重量％的四氟乙烯单元和约2至40重量％的至少一种其它单体的共聚物。 At least one other monomer such form of the invention may be used for melt-processible copolymers, such as those containing at least about 60 to 98 weight% tetrafluoroethylene units and about 2-40% by weight. 一般希望根据所用的含氟表面活性剂、所用氟聚醚酸或盐的分子量、含氟聚合物分散体的指定特性等来调节聚合剂中含氟表面活性剂与氟聚醚酸或盐的确切比例。 The generally desirable fluorine-containing surfactant is used, the molecular weight of the fluoropolyether acids or salts, to specify characteristics of the fluoropolymer dispersion is adjusted exactly polymerizer fluorine-containing surfactant and the fluoropolyether acid or salt with proportion. 优选地，按含水聚合反应介质中水的重量计，用于含水聚合反应介质中的氟聚醚酸或盐的量为约5至约3，OOOppm0按含水聚合反应介质中水的重量计，用于含水聚合反应介质中的氟聚醚酸或盐的量更优选为约5至约2000ppm,甚至更优选约50至约1000ppm,并且最优选约100至约350ppm。  Preferably, the aqueous polymerization medium by weight of water, for the amount of fluoropolyether acids or salts in the aqueous polymerization medium is from about 5 to about 3, OOOppm0 by weight aqueous polymerization reaction medium of water meter, the amount of the aqueous polymerization medium for the fluoropolyether acids or salts is more preferably from about 5 to about 2000 ppm, and even more preferably from about 50 to about 1000 ppm, and most preferably from about 100 to about 350ppm. 按含水介质中的水的重量计，用于如本发明所述优选方法中的聚合剂组合的总量为约5至约10，OOOppm,更优选约5至约3000ppm。 The total amount of the aqueous medium by weight of water, the preferred method for the polymerization agent composition of the present invention as is from about 5 to about 10, OOOppm, more preferably about 5 to about 3000ppm. 按含水介质中的水的重量计,所用聚合剂组合的总量甚至更优选为约50至约3000ppm,还更优选约50ppm至约2000ppm,最优选约150ppm 至约500ppm。 The total amount of the aqueous medium by weight of water, the polymerization initiator composition is used and even more preferably from about 50 to about 3000 ppm of, still more preferably from about 50ppm to about 2000 ppm, most preferably from about 150ppm to about 500ppm. 优选在聚合反应开始之前将至少一部分聚合剂加入到聚合反应中。  preferably before the start of the polymerization reaction at least a portion of the polymerization agent is added to the polymerization reaction. 如果稍后加入，则可使用多种聚合剂加入模式，包括在整个聚合反应期间连续加入，或在聚合反应期间的预定时刻定量或间歇加入。 Later, if added, can be used a variety of modes of addition polymerization agent, including continuously throughout the polymerization, or added at a predetermined time during the polymerization reaction quantitatively or intermittently. 根据本发明的一个实施方案，在聚合反应开始之前，优选在引发剂加入之前，将基本上所有的聚合剂加入到含水介质中。 According to one embodiment of the present invention, before the start of the polymerization reaction, the initiator is preferably added prior to, substantially all of the polymerization agent is added to the aqueous medium. 根据本发明，按含水介质中的水的重量计，含水介质包含小于约300ppm的、具有8或更多个碳原子的全氟链烷羧酸或盐含氟表面活性剂。  According to the present invention, according to the weight of the aqueous medium, the aqueous medium is water comprises less than about 300ppm of perfluoroalkane carboxylic acid or salt fluorosurfactants having 8 or more carbon atoms. 具有8或更多个碳原子的全氟链烷羧酸或盐含氟表面活性剂包括具有例如8至14个碳原子的此类表面活性剂，例如全氟辛酸和盐以及全氟壬酸和盐。 Perfluoroalkane carboxylic acid or salt fluorosurfactants having 8 or more carbon atoms include, for example, having from 8 to 14 carbon atoms such surfactants such as perfluorooctanoic acid and perfluorononanoic acid and salts thereof, and salts thereof. 优选地，所述含水介质包含小于约lOOppm，更优选小于50ppm的具有8或更多个碳原子的全氟链烷羧酸或盐含氟表面活性剂。 Preferably, the aqueous medium comprises less than about lOOppm, more preferably less perfluoroalkane carboxylic acid or salt fluorosurfactants having 8 or more carbon atoms of 50ppm. 在本发明的一个优选实施方案中，所述含水介质基本上不含具有8或更多个碳原子的全氟链烷羧酸或盐含氟表面活性剂。 In a preferred embodiment of the invention, the aqueous medium is substantially free of perfluoroalkane carboxylic acid or salt fluorosurfactants having 8 or more carbon atoms. 基本上不含具有8或更多个碳原子的全氟链烷羧酸或盐含氟表面活性剂是指含水介质包含不超过约IOppm的此类含氟表面活性剂。 Perfluoroalkane carboxylic acid or salt thereof is substantially free of fluorinated surfactant having 8 or more carbon atoms refers to an aqueous medium containing such a fluorine-containing surfactant is not more than about IOppm. 根据本发明的一种优选形式，用于本发明的实践中的聚合剂组合优选基本上不含全氟聚醚油(即具有中性非离子优选氟或氢端基的全氟聚醚)。  According to a preferred form of the invention, the polymerization agent composition for practice of the present invention is preferably substantially free of perfluoropolyether oil (i.e., having a neutral nonionic perfluoro fluorine or hydrogen end groups preferably poly ether). 基本上不含全氟聚醚油是指，以水为基准，含水聚合反应介质包含不超过约IOppm的此类油。 Substantially free of perfluoropolyether oil refers, based on water, such an aqueous polymerization medium contains no more than about IOppm of oil. 本发明的这种形式不同于授予Gianetti等人的美国专利4，864，006中所公开的使用此类全氟聚醚油的含水微乳液体系。 4,864,006 disclosed the use of such an aqueous microemulsion perfluoropolyether oil of this form of the present invention is different from Grant et al U.S. Patent No. Gianetti. 因此，优选制得的含氟聚合物分散体具有高纯度，并且包含少量残余表面活性剂，并且优选基本上不含全氟聚醚油。 Accordingly, it is preferable to prepare fluoropolymer dispersions having a high purity and contains a small amount of residual surfactant, and preferably substantially free of perfluoropolyether oil. 此外，在优选的方法中，聚合反应介质在聚合反应起始点处基本上不含含氟聚合物晶种。 Further, in a preferred process, the polymerization medium is substantially free of fluoropolymer seed at polymerization of the starting point. 在本发明的这种优选形式中，在聚合反应开始之前不加入含氟聚合物晶种，即分散体形式的独立聚合的含氟聚合物小颗粒。 In this preferred form of the invention, before the start of the polymerization reaction without the addition of the fluoropolymer seed, i.e., polymerized fluoropolymer dispersion independently in the form of small particles. 已出乎意料地发现，数均分子量为至少约800g/mol的氟聚醚酸或盐与链长不超过6的含氟表面活性剂的组合可提供有效的聚合剂以用于氟聚合物生产中；其中，当单独使用时，链长不超过6的含氟表面活性剂在用于含氟聚合物商业生产的含氟聚合物固体浓度下不会获得所期望的低凝结物含量。  It has unexpectedly been found that a combination of number average molecular weight of at least about 800g / mol of fluoropolyether acid or salt with a chain length of the fluorinated surfactant is not more than 6 can provide an effective polymerization agent for fluorine polymer production; wherein, when used alone, the chain length of the fluorinated surfactant is not more than 6 in the fluoropolymer solids for commercial production of fluoropolymers to achieve the desired concentration is not low coagulum content . 根据本发明，聚合剂组合可制得与授予Berry的美国专利2，559，752中公开的使用典型全氟链烷羧酸表面活性剂和高分散固体浓度制得的那些相等的氟聚合物。 According to the present invention, the polymerization agent compositions may be prepared and disclosed in U.S. Patent No. 2,559,752 to Berry in the typical perfluoroalkane carboxylic acid surfactants and equal to those of the fluoropolymer dispersion of high concentration of solids obtained. 根据ASTM D4591方法，由差示扫描量热法测定共聚物的熔点(Tm)和玻璃化转变温度(Tg)。  The ASTM D4591 method, a melting point (Tm) determined by differential scanning calorimetry of the copolymer and the glass transition temperature (Tg). 根据ASTM D-4591-87方法，由差示扫描量热法(DSC)测定PTFE均聚物的熔点(聚合物第一次加热的熔点，还被称为第一焓变)。 The method according to ASTM D-4591-87 by differential scanning calorimetry (DSC) PTFE homopolymer melting point (the melting point of the polymer is first heated, also referred to as a first change in enthalpy) was measured. 报告的熔融温度是第一次熔融时的吸热峰值温度。 Melting temperature reported is the peak temperature at which an endothermic first melt. 根据ASTM D-4895方法测定标准比重(SSG)。  Determination of a standard specific gravity (SSG) in accordance with ASTM D-4895 method. 根据美国专利4，743，658第5栏第9至23行中所公开的方法，由FTIR测定共聚单体含量(PPVE或HFP)。  The method of U.S. Patent No. 4,743,658, col. 5, lines 9-23 as disclosed by FTIR determination of comonomer content (PPVE or HFP). 通过在2404CHT1至1550CHT1处相对于标定曲线比较吸光率，由IR测定共聚单体含量(PDD)。  At 2404CHT1 by 1550CHT1 relative to a calibration curve comparing absorbance, the comonomer content (PDD) determined by IR. 根据ASTM D-1238，在具体共聚物的标准温度下，测定熔融流动速率(MFR)。  According to ASTM D-1238, at standard temperature particular copolymer, measured melt flow rate (MFR). 对调节至包含1500ppm± IOOppm氟聚醚酸或盐的分散的氟聚醚酸或盐和含氟表面活性剂(以及分散助剂，如果使用的话)水浓缩液，测定雾度。  fluoropolyether acid or salt and fluorosurfactant comprises 1500ppm ± IOOppm dispersed fluoropolyether acid or salt thereof (as well as dispersion aids, if used) and concentrated aqueous solution was adjusted to the measurement of haze. 采用HunterLab UniversalSoftware v 4.0,以透射模式在具有球几何形状的Hunter®ColorQuest XE分光光度计上测定雾度。 4.0, haze was measured in transmission mode on Hunter®ColorQuest XE spectrophotometer having a spherical geometry using HunterLab UniversalSoftware v. 样本池为50mm透射透射池。 50mm sample pool for transmission transmission cell. 透射雾度量度是散射光与样品总透射光的比率乘以100表示为透射百分比。 Transmission haze metric is the ratio of scattered light and total transmitted light multiplied by the sample is expressed as 100 percent transmittance. 采用Wilhelmy Plate方法，在Kruess张力计K11-MK2 h测定表面张力。  The Wilhelmy Plate method, measuring the surface tension Kruess Tensiometer, K11-MK2 h.
 测定所选短链和长链表面活性剂的表面张力:(1)为铵盐水溶液,和(2)使所述表面活性剂水溶液与数均分子量为约2100(式V中的η=约12)的全氟聚醚羧酸混合。  Determination of surface tension of the selected short-chain and long-chain surfactant: (1) an aqueous solution of an ammonium salt, and (2) contacting the aqueous solution of surfactant having a number average molecular weight of about 2100 (in formula V η = about 12) perfluoropolyether carboxylic acid mixture. 全氟聚醚羧酸可以Krytox® 157 FSL从DuPont商购获得。 The perfluoropolyether acids may be obtained commercially Krytox® 157 FSL from DuPont. 此全氟聚醚羧酸(称为PFPEA2)还可用于举例说明本发明聚合反应的聚合反应实施例中。 This perfluoropolyether carboxylic acid (referred PFPEA2) may also be used to illustrate the present invention, the polymerization reaction of the polymerization reaction embodiment. 通常，如果表面活性剂为酸形式，则将其加入到水中，随后加入含水氢氧化铵(30重量％的水溶液，重量％按NH3计算)，并且手动或用磁力搅拌器搅拌。  Generally, if the surfactant is the acid form, it is added to water, followed by addition of aqueous ammonium hydroxide (30% by weight aqueous solution, calculated as the NH3 wt%), and stirred with a magnetic stirrer, or manually. 在所指定的附加搅拌下加入额外的水，以便表面活性剂浓度按水的重量计为6000ppm。 Additional water was added under stirring an additional designated to surfactant concentration by weight of water was 6000ppm. 如果所述表面活性剂为铵盐水溶液形式，则将表面活性剂盐稀释并且搅拌，而不加入更多的氢氧化铵。 If an aqueous solution of an ammonium salt, then diluted surfactant salt and stirred, without the addition of more ammonium hydroxide. The surfactant 加入足量的水，以便以水为基准，表面活性剂浓度为6000ppm。 Add sufficient water to water as a reference, the surfactant concentration is 6000ppm. 通过相继加入PFPEA 2、水、含水氢氧化铵、表面活性剂、所需的附加水，并且手动或用磁力搅拌器搅拌，制备表面活性剂与全氟聚醚羧酸以5: I重量比率组合的样本。  By successively added PFPEA 2, water, aqueous ammonium hydroxide, the surfactant, the required additional water, and manually or by a magnetic stirrer to prepare a surfactant and the perfluoropolyether carboxylic acid is 5: I the weight ratio of the combined samples. 样本的视觉外观一般是透明的，雾度小于5%。 The visual appearance of the sample is generally transparent, haze of less than 5%. 加入足量的水，以便表面活性剂浓度按水的重量计为6000ppm。 Add sufficient water to surfactant concentration by weight of water was 6000ppm. 使用Kruess张力计K11-MK2进行表面张力测定。  using a Kruess Tensiometer, K11-MK2 surface tension measuring. 表面张力数据为取自仪器的10个数据点的平均。 Mean surface tension data from the instrument 10 data points. 在环境温度(23°C)下进行测定。 Measured at ambient temperature (23 ° C). 表面活性剂独自的表面张力以及表面活性剂与PFPEA 2组合的表面张力报告于表A和B中。 Surfactant alone and the surface tension of the surface tension of a surfactant in combination with PFPEA 2 are reported in Table A and B. 在相同条件下，具有短链长的表面活性剂具有的表面张力值显著高于全氟辛酸及其盐以及许多其它长链长表面活性剂的表面张力值。 Under the same conditions, having a short chain length value of the surface tension of the surfactant having a significantly higher PFOA and its salts, and a surface tension of many other long chain length surfactants. 短链表面活性剂与PFPEA 2的组合具有的表面张力显著低于单独使用的表面活性剂的表面张力，即在6000ppm浓度和23°C下具有的水中表面张力比比单独的含氟表面活性剂在6000ppm浓度和23°C下具有的`水中表面张力低至少约30%。 Short chain surfactants in combination with PFPEA 2 having a surface tension of surfactants is significantly lower than the surface tension used alone, i.e., having a concentration of 6000ppm at 23 ° C and the surface tension of water alone Bibi fluorinated surfactant in `water having a low surface tension and concentration of 6000ppm at 23 ° C of at least about 30%. 当进行实施例1-1V中的表面张力测定时，将去离子水的表面张力记录为67.9达因/厘米。  When the tension measuring surface 1-1V embodiment embodiment, the recording surface tension of deionized water to 67.9 dyne / cm. 当进行比较实施例VI和VII中的表面张力测定时，将去离子水的表面张力记录为67.9达因/厘米。  When compared to the tension measured in Example VI and VII surfaces embodiment, the recording surface tension of deionized water to 67.9 dyne / cm. 62.5达因/厘米。 62.5 dyne / cm. 在实施例1至9和比较实施例5至7中，使用具有式CF3CF2CF2OCF (CF3) COOH (被称为二聚体酸或DA)结构的氟代单醚酸，其在以下实施例中可转变成铵盐(被称为二聚体酸盐或DAS)。  In Examples 1-9 and Comparative Example 5-7, using fluorinated acid monoether having the formula CF3CF2CF2OCF (CF3) COOH (referred to as dimer acid or DA) structure, which in the following Example It may be converted into ammonium salts (referred to as dimer acid or DAS). 在实施例10至14和比较实施例8至10中，使用具有式C4F9S02NHCH2CH20H结构的氟代烷基磺酰胺含氟表面活性剂。  In Examples 10 to 14 and in Comparative Examples 8 to 10, a fluoroalkyl sulfonamide fluorochemical surfactants having the formula C4F9S02NHCH2CH20H structure. 所述表面活性剂可以25重量％的含水铵盐形式以商标N0VEC™4200 得自3M SpecialtyMaterials, St Paul，MN。 The surfactant may be an aqueous 25 wt% ammonium salt form under the trademark N0VEC ™ 4200 available from 3M SpecialtyMaterials, St Paul, MN. 使用两种氟聚醚酸，其为具有羧酸基团的全氟聚醚酸(PFPEA)，每种具有上文式I结构的重复单元，并且在以下实施例中可转变成铵盐。  two fluoropolyether acid, which is a perfluoropolyether having acid (of PFPEA) carboxylic acid groups, each having a repeating unit structure of Formula I above, and may be converted to ammonium embodiment in the following embodiments salt. PFPEAl具有约1165(式I中η =约6)的数均分子量。 PFPEAl number of about 1165 (in formula I to about η = 6) average molecular weight. PFPEA 2具有约2100(式I中η =约12)的数均分子量。 PFPEA 2 of about 2100 (formula I, from about η = 12) Number-average molecular weight. PFPEA 2可作为Krytox® 157 FSL 从DuPont 商购获得。 PFPEA 2 commercially available from DuPont as Krytox® 157 FSL. 实施例1至9和比较实施例5至7中的氢氧化铵为30重量％的水溶液(重量％按NH3计算)。  Examples 1 to 9 and Comparative Examples of ammonium hydroxide in 5 to 7 30% by weight aqueous solution (% by weight calculated NH3). 对于包含PFPEA I的实施例1、2和4，通过首先将510g去离子水加入到I升玻璃容器中来制备包含PFPEA I的聚合剂浓缩液。  For embodiments of PFPEA I comprising 1, 2 and 4, by first added 510g of deionized water to I liter glass vessel to prepare a polymerization agent concentrate comprising of I of PFPEA. 将如表1中所示量的30重量％的氢氧化铵加入到510g去离子水中。 The amount of 30% by weight as shown in Table 1% ammonium hydroxide were added to 510g of deionized water. 接着加入如表1中所示量的PFPEA I。 Followed by addition of an amount as shown in Table 1 PFPEA I. 将容器中的内容物手动或用超声混合，以制得略微浑浊的混合物(雾度小于约7% )。 The contents of the container manually or ultrasonic mixing, to obtain a slightly turbid mixture (haze of less than about 7%). 加入如下表1中所示量的二聚体酸盐(DAS)。 In an amount shown in the following table dimer acid (DAS). 再次混合后，所述混合物变得无色透明。 Again after mixing, the mixture became colorless and transparent. 0.56g 二聚体酸盐(DAS)。 0.56g dimer acid (DAS). 最终混合物是无色透明的(雾度小于约3% )。 The final mixture was colorless and transparent (haze of less than about 3%). 对于实施例5至8，通过在小瓶中混合5g 二聚体酸(DA)和1.3gPFPEA 2来制备聚合剂浓缩液。  For Examples 5 to 8, a dimer acid prepared by mixing 5g (DA) in a vial and 1.3gPFPEA 2 be prepared by polymerizing agent concentrate. 在温和搅拌下向该混合物中滴加1.86g含水氢氧化铵(30重量％ )。 To this mixture was added dropwise 1.86g aqueous ammonium hydroxide under mild stirring (30 wt%). 在剧烈搅拌下将该混合物滴加到900g去离子水中。 Under vigorous stirring and the mixture was dropwise added 900g of deionized water. 最终混合物是无色透明的(雾度小于约3% )，并且具有8.5的pH。 The final mixture was colorless and transparent (haze of less than about 3%), and having a pH 8.5. 这些实施例中的二聚体酸用作PFPEA 2的分散剂以及聚合剂中的组分。 These embodiments of the dimer acid is used as a dispersant and a polymerization agent of component PFPEA 2. 对于实施例9，通过在小瓶中混合14.25g 二聚体酸和3.71g PFPEA 2来制备聚合剂浓缩液。  For Example 9, a dimer acid prepared by mixing 14.25g and 3.71g PFPEA 2 was prepared in a vial polymerization agent concentrate. 当小瓶在冰中冷却时，在搅拌下滴加5.3g含水氢氧化铵(30重量％)。 When the vial was cooled in ice, was added dropwise with stirring 5.3g aqueous ammonium hydroxide (30 wt%). 所得混合物是无色透明的，并且在搅拌下滴加到900g脱气水中，以获得pH为9的无色透明(雾度小于约3%)溶液。 The resulting mixture was colorless and transparent, and added dropwise with stirring 900g degassed water, to obtain a pH of 9 as a colorless transparent (haze of less than about 3%) solution. 以相同的方式制得第二份表面活性剂溶液。 It was prepared in the same manner as the second parts of surfactant solution. 此实施例中的二聚体酸用作PFPEA 2的分散剂以及聚合剂中的组分。 As a dispersant and a polymerization agent component PFPEA 2 of this example embodiment a dimer acid. 本发明的方法例示于四氟乙烯(TFE)与全氟(烷基乙烯基醚)即全氟(丙基乙烯基醚)(PPVE)的可熔融加工共聚物的聚合反应中。  The method of the present invention is illustrated in tetrafluoroethylene (TFE) polymerisation reaction with perfluoro (alkyl vinyl ether), i.e., perfluoro (propyl vinyl ether) (PPVE) melt-processible copolymers. 在所述聚合反应中使用脱气水。  deaerated water used in the polymerization reaction. 通过将去离子水泵送到大不锈钢容器中并且在约30分钟内使氮气经由水剧烈鼓泡以除去所有氧气，来制备脱气水。 Deionized water is pumped by a large stainless steel vessel and the nitrogen gas in about 30 minutes through the water to remove all of the oxygen was bubbled vigorously, degassed water was prepared. 在配备叶片式搅拌器的12升水平式高压釜中，加入7.57kg脱气水。  12-liter autoclave equipped with blade stirrer, degassed water was added 7.57kg. 将5IOmL上述PFPEA I或PFPEA 2浓缩液加入到高压釜中，以提供用于实施例的聚合反应介质。 The above PFPEA I 5IOmL PFPEA 2 or concentrate was added to the autoclave, to provide a polymerization medium for the embodiment. 根据用于浓缩液的量，表2A示出了含有引发剂、链转移剂和单体的聚合反应介质中聚合剂组分的量(ppm，以含水介质中水的重量为基准)。 The amount of concentrate used, Table 2A shows the amount of the polymerization medium comprising initiator, chain transfer agent and monomer in the polymerization of component (ppm, by weight of water in the aqueous medium as a reference). 将约28英寸水柱(7kPa)的真空施加在反应器上。  A vacuum of about 28 inches of water (7kPa) applied to the reactor. 然后在以70rpm速度搅拌的同时，用气态四氟乙烯(TFE)将反应器压力升至30psig(310kPa)。 Next, while stirring at 70rpm speed, with gaseous tetrafluoroethylene (TFE) pressure in the reactor was raised to 30psig (310kPa). 关闭搅拌器，并且通过放空使TFE压力降至约IOpsig(IOOkPa)。 Stirrer was turned off, and that the TFE pressure was reduced by venting to about IOpsig (IOOkPa). 将此加压/放空循环再实施两次,进一步确保高压爸中的内容物不含氧气。 This pressure / venting cycle further embodiment two further ensure the contents of the high pressure dad free of oxygen. 然后将乙烷(0.3至0.5g)和全氟(丙基乙烯基醚)(PPVE) (100g)加入到反应器中。 Then ethane (0.3 to 0.5g) and perfluoro (propyl vinyl ether) (PPVE) (100g) was added to the reactor. 然后在以IOOrpm速度搅拌下，将反应器加热至75°C。  Then at IOOrpm speed stirring, the reactor was heated to 75 ° C. 当到达温度时，通过加入TFE (270至330g)，使反应器压力升至标称300psig(2.17MPa)。 When the temperature reached by the addition of TFE (270 to 330g), the reactor pressure was raised to a nominal 300psig (2.17MPa). 将I升包含6.2克过硫酸铵的引发剂去离子水溶液以lOOml/min的速率加入到高压釜中，以提供0.45至0.74g过硫酸铵预载量，如表2A中所示。 The I liter contains 6.2 grams of ammonium persulfate initiator in deionized water at a rate of lOOml / min was added to the autoclave, to provide 0.45 to 0.74g of ammonium persulfate was pre-load, as shown in Table 2A. 在聚合反应期间，以0.54ml/min的速率将相同的引发剂溶液连续泵送到高压釜中。 During the polymerization reaction, a rate of 0.54ml / min of the same initiator solution was continuously pumped into the autoclave. 认为聚合反应在起始点处(定义为观测到压力降低10psig(70kPa)时的点)开始进行。 That the polymerization reaction at the starting point (defined as the observation point when the pressure is reduced to 10 psig (70kPa)) starts. 通过间歇补充由96重量％ TFE和4重量％ PPVE构成的单体，使反应器压力在285psig(2.1MPa)和315psig(2.28MPa)之间循环。 Supplemented by intermittently monomers 96 wt% TFE and 4 wt% PPVE configuration, the reactor pressure is circulated between 285psig (2.1MPa) and 315psig (2.28MPa). 在所有单体(包括预载的PPVE和TFE)达到了如表2A中所示的量，关闭搅拌器，并且将反应器放空至大气压。 In all monomers (including preloaded and PPVE TFE) reaches an amount as shown in Table 2A, stirrer is switched off, and the reactor was vented to atmospheric pressure. 由此制得的含氟聚合物分散体具有大于10%的固体含量。 The fluorine-containing polymer dispersion thus prepared has a solids content of greater than 10%. 通过冷却、融化和过滤，从分散体中分离出聚合物。 By cooling, thawing and filtration, the polymer was separated from the dispersion. 使用高速搅拌器，在去矿物质水中洗涤所述聚合物，并且过滤若干次，之后在温度为100至110°C以及真空为6至10mmHg(0.8-1.3kPa)的真空烘箱中干燥过夜。 Using a high speed stirrer, in demineralised water to wash the polymer, and filtered several times before being dried overnight in a vacuum oven at a temperature of from 100 to 110 ° C and a vacuum of 6 to 10mmHg (0.8-1.3kPa) of. 结果报告于表2B中。 Results are reported in Table 2B. 依照实施例1至3的通用方法，制备比较实施例，其中使用PFPEA和DAS中的一种而不是二者都用。  In accordance with the general method of Example 1 to 3, Comparative Example was prepared, where one PFPEA and the DAS are used but not both. 在比较实施例1至4中，仅使用PFPEA (PFPEA2)。 In Comparative Examples 41 to the embodiment, only PFPEA (PFPEA2). 在比较实施例5至7中，仅使用DAS。 In Comparative Example 5-7, only the DAS. 表2A示出了含有引发剂、链转移剂和单体的聚合反应介质中聚合剂组分的量(ppm，按含水介质中的水的重量计)。 Table 2A shows the amount (ppm, in the aqueous medium by weight of water) medium containing a polymerization initiator, chain transfer agent and monomer in the polymerization component. 聚合反应结果总结于表2B中。 Polymerization results are summarized in Table 2B. 与实施例1至3相t匕，比较实施例获得的产物胶凝或沉淀，这两种情况均是不稳定分散体的表征，或者除了分散体以外还具有大量非分散的聚合物，者同样是不充分稳定的分散体的表征。 1-3 with Example dagger t, gelation or precipitation of the product obtained in Comparative Example, both of which are characterized by an unstable dispersion, or in addition to the dispersion also has a large number of non-dispersed polymer, by the same Characterization is not sufficiently stable dispersions. PFPEA和DAS单独均不足以使水分散体聚合，获得固体大于约10重量％的聚合物分散体。 PFPEA and DAS alone sufficient for the aqueous dispersion polymerization, a solid is greater than about 10% by weight of the polymer dispersion. ~实施例1至2使用PFPEA I。  Example 1-2 - Use PFPEA I. 实施例3和比较实施例1至4使用PFPEA 2。 Example 3 and Comparative Examples 1 to 4 using PFPEA 2. *叔丁醇在表面活性剂混合物制备中用作分散助剂。  * t-butanol as dispersing aids in the preparation of a surfactant mixture. *叔丁醇在表面活性剂混合物制备中用作分散助剂。  * t-butanol as dispersing aids in the preparation of a surfactant mixture. 链转移活性显示已影响熔融流动速率。 Effect of chain transfer activity displays melt flow rate. 本发明的方法例示于四氟乙烯(TFE)与六氟丙烯(HFP)的可熔融加工共聚物的聚合反应中。 Method  The present invention is illustrated in the polymerization of tetrafluoroethylene (TFE) and hexafluoropropylene (HFP) melt-processible copolymer. 以与四氟乙烯-全氟(丙基乙烯基醚)实施例1至2(PFPEA1)中的共聚反应相似的方式进行四氟乙烯-六氟丙烯共聚反应，不同在于: 总水量(起始加入量加上伴随引发剂和聚合剂加入的水)为6540g。  A tetrafluoroethylene - a manner similar to Example (PFPEA1) in the copolymerization reaction 1-2 perfluoro (propyl vinyl ether) is a tetrafluoroethylene - hexafluoropropylene copolymer reaction, except that:  the total amount of water (plus the initial amount of water along with an initiator and polymerization agent added) was 6540g. 6.2g/升水溶液中，引发剂预载量为0.66g。 6.2g / liter of the aqueous solution, the initiator pre-loading agent is 0.66g. 初始HFP加入量为568g。 The initial HFP amount to 568g. 初始TFE加入量为379g，为60: 40的气体共混物。 The initial amount of TFE added 379g, 60: 40 blend of gas. 聚合反应期间HFP: TFE给料为以1200g/小时的速率加入12: 88的混合物。 During the polymerization HFP: TFE feed rate of 1200g / hour to the 12: 88 mixture. 表3A示出了含有引发剂、链转移剂和单体的聚合反应介质中聚合剂组分的量(ppm，按含水介质中的水的重量计)。  Table 3A shows the amount of the polymerization medium component polymerization initiator, chain transfer agent and a monomer containing (ppm, in the aqueous medium by weight of water). 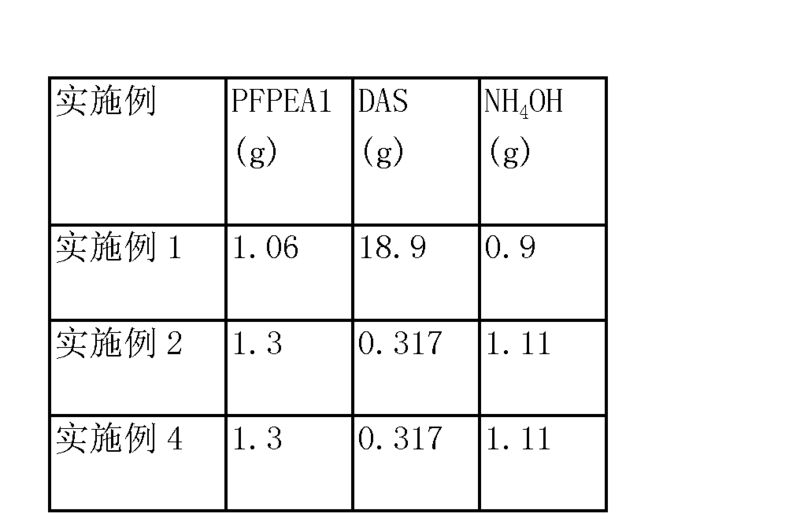 聚合反应结果总结于表3B中。 Polymerization results are summarized in Table 3B. 本发明的方法例示于聚四氟乙烯(PTFE)均聚物的聚合反应中。  The method of the present invention is illustrated in the polymerization of polytetrafluoroethylene (PTFE) homopolymer in. 1.在氮气下将蜡(260g)熔融，并且通过热加料漏斗加入到反应器中。  1. under nitrogen wax (260g) melted and added to the reactor by the heat addition funnel. 2.脱气水，4375g。  2. degassed water, 4375g. 4.琥珀酸，3g溶于500mL溶液中。  4. succinic acid, 3g was dissolved in 500mL of solution. 5.草酸，从IOOmL包含2g草酸的水溶液中取15mL。  The oxalic acid, 15mL taken from an aqueous solution containing 2g IOOmL oxalic acid. 加入四氟乙烯(TFE)，以使反应器压力达到约30psig(310kPa)。  added tetrafluoroethylene (TFE), to bring the reactor pressure to about 30psig (310kPa). 然后将反应器放空至正好高于大气压。 The reactor was then vented to atmospheric pressure just above. 将此加入/放空循环重复两次。 Add this / venting cycle was repeated twice. 将反应器加热至80°C，当温度达到60°C时开启搅拌器，速度为65rpm。  The reactor was heated to 80 ° C, the stirrer was started when the temperature reaches 60 ° C, a speed of 65rpm. 加入TFE，以使反应器压力达到400psig(2.9MPa)。 Added TFE, to bring the reactor pressure to 400psig (2.9MPa). 加入约685gTFE。 Add about 685gTFE. 以100mL/min的速率加入50至80mL的引发剂溶液(“预载”)，随后以1.5mL/min的速率连续加入。  at a rate of 100mL / min to 80mL was added 50 initiator solution ( "pre-load"), and then at a rate of 1.5mL / min were added continuously. 引发剂溶液为0.15g高锰酸钾(KMnO4)的1000g脱气水溶液，所述溶液包含5mL磷酸二铵(NH4)2HPO4溶液，其为2.8g (NH4)2HPO4的200mL水溶液。 Initiator solution of 0.15g of potassium permanganate (of KMnO4) 1000g of aqueous degassed, the solution containing 5mL DAP (NH4) 2HPO4 solution, which is an aqueous solution of 200mL 2.8g (NH4) 2HPO4 in. 在引发剂加入后约I分钟，起始点出现(定义为观察到压力降低10psig(70kPa)的时刻)，并且聚合反应开始。  about I minute, the starting point appears after addition of the initiator (defined as the decrease in the pressure was observed in time 10psig (70kPa)), and starting the polymerization reaction. 在聚合反应期间，定时加入TFE以保持反应器压力介于约395和405psig(2.7和2.8MPa)之间。 During the polymerization, TFE was added to maintain the timing between about 395 and 405psig (2.7 and 2.8MPa) interposed between the reactor pressure. 在已消耗IlOOg TFE之后，停止引发剂给料。 After having consumed IlOOg TFE, initiator stop feeding. 在已消耗2500g TFE之后，关闭搅拌器，并且将反应器放空。 After having consumed 2500g TFE, stirrer is switched off, and the reactor was vented. 在还热的时候将聚合物分散体从反应器中排出，并且使其冷却。 The polymer dispersion was discharged from the reactor in the still hot, and allowed to cool. 冷却后，分离出固化的蜡，并且称重。 After cooling, the separated solidified wax, and weighed. 将反应器打开并且清洁，将清洁时回收的物质指定为未分散的聚合物，将其称重。 The reactor was opened and cleaned, when the cleaning material designated recovered as undispersed polymer, which weighed. 将分散体称重并且确定固体百分比。  The dispersion was weighed and the percent solids determined. 通过将一部分分散体冷却和融化使聚合物凝结，并且洗涤和干燥凝结物，来回收聚合物。 By melting a portion of the dispersion was cooled and the polymer coagulated, washed and dried, and condensate was recovered polymer. 结果总结于表4中。  The results are summarized in Table 4. 均显示具有约30重量％固体含量和聚四氟乙烯熔点特征的聚合物。 They showed about 30% polymer solids content by weight and having a melting point of polytetrafluoroethylene features. 聚合反应条件类似于实施例5至7的条件，不同的是引发剂变为具有少量过硫酸铵(APS)的过氧化二琥珀酸(DSP)。  Polymerization conditions similar conditions as in Example 5-7 embodiment, except that the initiator having a small amount of ammonium persulfate becomes (APS) of disuccinic acid peroxide (DSP). 将1.5g DSP加入到IOOmL水溶液和ImL的I重量％的APS水溶液中。 1.5g DSP is added to the solution and ImL of IOOmL I wt% aqueous solution of APS. TFE消耗量为2000g。 TFE consumption of 2000g. 总反应时间为227分钟。 The total reaction time was 227 minutes. 聚合物分散体的重量为7906g，并且含有26.7%固体。 Weight of the polymer dispersion was 7906g, and containing 26.7% solids. 聚合物熔点为344.7°C。 Polymer melting point 344.7 ° C. 回收370g蜡(这超过了加入的蜡，说明某些凝结物混入到回收蜡中)。 370g recovered wax (the wax added exceeds it, indicating that some of the recovered condensate is mixed into the wax). 反应器未打开，因此无法确定凝结物。 The reactor is not open, so the condensate can not be determined. 与实施例8相同，使用含有APS引发剂的DSP，但是配备有叶片式搅拌器的水平式高压釜具有34.4升(约9加仑)容量。  As in Example 8, containing DSP APS initiator, but equipped with a blade stirrer horizontal autoclave with 34.4 liters (about 9 gallons) capacity. 加入的水为14，700g，并且蜡为850g。 Water was added 14,700g, and the wax is 850g. 然后，将如上所述制备的1800mL PFPEA 2/DAS聚合剂浓缩液加入到加入到高压釜中。 Then, the prepared as described above 1800mL PFPEA 2 / DAS was added to the polymerization concentrate was added to the autoclave. 向反应器充入1716g TFE，至375psig(2.7MPa)。 1716g TFE charged to the reactor to 375psig (2.7MPa). 引发剂加入量为340g包含11.9g过氧化二琥珀酸和3.4mL的I重量％过硫酸铵水溶液的水溶液。 Initiator is added in an amount of 340g 11.9g comprising disuccinic acid peroxide aqueous solution 3.4mL and I wt% ammonium persulfate aqueous solution. TFE消耗量为9000g。 TFE consumption of 9000g. 总反应时间为223分钟。 The total reaction time was 223 minutes. 回收25，637g分散体。 Recovering 25,637g dispersion. 固体含量为35.1%。 A solids content of 35.1%. SSG为2.203。 SSG of 2.203. 回收蜡578g。 Recycling wax 578g. 凝结物为622g，6.5重量％。 Condensate of 622g, 6.5 wt.%. 本发明的方法例示于四氟乙烯(TFE)与全氟(2，2_ 二甲基-1，3-二氧杂环戊烯)(PDD)共聚物的聚合反应中。 Method  The present invention is illustrated in tetrafluoroethylene (TFE) and perfluoro (2,2_-dimethyl-1,3-dioxole) (the PDD) copolymer polymerization reaction. 在IL竖式不锈钢夹套式高压釜中制备TFE和全氟(2，2-二甲基-1，3-二氧杂环戊烯)(roD)的共聚物，所述高压釜配备具有3个约0.61cm(l/4")宽、12.7cm(5")长叶片的带式搅拌器，和2个0.61(1/4")宽的垂直导流板，架于反应器长度方向上。通过加入包含2.5g过硫酸铵(APS)的600mL去离子(DI)水，并且在剧烈搅拌下将此混合物在90°C下加热3小时，来使反应器处于正常状态。排空反应器，用DI水冲洗，并且重新充入600mL新鲜的DI水。将反应器及其内容物用氮气吹扫和放空三次，并且如下表5A中所示，加入25mL聚合剂。然后将反应器内容物加热至60°C，并且将反应器中的氮气氛放空，并且替换为TFE。当达到热平衡时，以表中指定的预载比率将TFE和PDD物流送入到反应器中。用质量流量计监测和调节气态TFE给料，并且用Gilson计量泵调节液体PDD物流。持续单体给料，直至达到所期望的反  IL copolymer vertical jacketed stainless steel autoclave preparing TFE and perfluoro (2,2-dimethyl-1,3-dioxole) (ROD) of the autoclave 3 is equipped with about 0.61cm (l / 4 ") wide, 12.7cm (5") long with a blade stirrer, 0.61 and two (1/4 ") wide vertical baffles in the reactor rack the longitudinal direction by the addition of 2.5g ammonium persulfate comprising (APS) in 600mL deionized (DI) water, and heated with vigorous stirring for 3 hours at 90 ° C for this mixture to the reactor in a normal state. row empty the reactor, rinsed with DI water, and refilled with fresh DI water 600mL. the reactor and its contents were purged with nitrogen and vented three times, and as shown in table 5A, was added 25mL polymerization agent. the reaction is then contents were heated to 60 ° C, and the reactor is vented in a nitrogen atmosphere, and replaced TFE. when thermal equilibrium is reached in table specified preload ratio of TFE and PDD stream fed to the reactor. with mass flow meter monitor and regulate the gaseous TFE feed, and adjusting the liquid pump with a Gilson metering PDD stream. monomer feed continued until the counter reaches a desired 器压力。停止物流，并且完成了单体预载。通过注入IOmL包含1.0g APS的DI水引发聚合反应，并且观测到反应器压力降低。此时，以指定比率重新开始加入单体物流，并且速率足以保持反应器压力。在实施例12-15和17中，反应器压力为48psig。在实施例16中，反应器压力为30。持续加入物流，直至向反应器中加入了预定量的单体。此时停止物流，并且在保持短暂的一段时间后，将反应器冷却，放空至大气压，并且排放出聚合物分散体。将收集的分散体称重，并且与加入到反应器中的所有物质的总重量相比较。此质量余量检验可用于确定反应器中是否发生聚合物的凝结反应。质量余量小于90%，表明发生了显著的凝结反应。 Pressure. Stop stream, and completed the preload monomers. IOmL by implanting the DI water containing 1.0g APS polymerization initiator, and the reactor pressure is reduced was observed. At this time, in order to specify the ratio of re-addition of the monomer stream, and a rate sufficient to maintain the reactor pressure. in Example 12-15 and 17, the reactor pressure 48psig. in Example 16, the reactor pressure was continuously added 30. the stream until a predetermined amount is added to the reactor in a single body. at this stream is stopped, and after a short holding period, the reactor was cooled, vented to atmospheric pressure, and the discharged polymer dispersion. the dispersion was collected weighed and added to the reactor with all of compared to the total weight of the substance. this mass balance test can be used to determine whether the polymer coagulation reaction occurs in the reactor. mass balance of less than 90%, indicating the occurrence of significant coagulation reaction. 上述方法可用于评价TFE和PDD乳液聚合反应中包含磺酰胺NOVeC™4200表面活性剂的聚合剂以及包含所述磺酰胺与PFPEA 2的组合的聚合剂。  The above method can be used to evaluate the emulsion polymerization of TFE and PDD comprising sulfonamide NOVeC ™ 4200 polymeric agents and surfactant composition comprising the sulfonamide PFPEA 2 with a polymerization agent. 将所提供的Novec™ 4200表面活性剂(25重量％的铵盐水溶液)与PFPEA 2混合。  The surfactant Novec ™ 4200 provides (25 wt% aqueous solution of ammonium salt) was mixed with 2 PFPEA. 不另外加入氢氧化铵。 No further addition of ammonium hydroxide. 将此混合物摇晃和滚转若干小时，以制得浓缩液。 The mixture was shaken and tumbling for several hours, to prepare a concentrate. 结果总结于下表5A和5B中。  5A and 5B, the results are summarized in Table. 比较实施例的特征在于产物分散体中的固体含量低，聚合物收率低，以及由单体给料时间短反应出的聚合反应提早终止。 Comparative Example characterized in that the low solids content of the product dispersion, the polymer yield is low, and the polymerization reaction of the monomer feed the short reaction time of early termination. 比较实施例中制得的聚合物的玻璃化转变温度和PDD含量低于类似条件下实施例中进行的实验。 The glass transition temperature and a PDD content of the polymer obtained in Comparative Example embodiments less than experiments conducted under similar conditions in the embodiment. 比较实施例中制得的聚合物的MFR还趋于过高，使得所述聚合物快速流出熔融指数仪，妨碍测定。 MFR of the polymer obtained in Comparative Example embodiments also tends to excessively high, so that the rapid outflow of the polymer melt indexer, impede measurement. 这些结果均表明，Novec™ 4200自身或含有最小量PFPEA 2的Novec™ 4200 (如比较实施9中所示)不可有效地作为聚合反应表面活性剂。 These results show that, Novec ™ 4200 containing a minimum amount itself or PFPEA Novec ™ 4200 (as shown in Comparative Example 9) 2 is not effective as polymerization surfactant. 使用Novec™ 4200和至少200mg PFPEA 2的实验结果可靠地获得一致的聚合反应结果，表明在这些条件下，这些混合物是适用于聚合反应的表面活性剂。 Experimental results using Novec ™ 4200 and at least 200mg PFPEA 2 reliably consistent polymerization results obtained, shows that under these conditions, a mixture of these surfactants suitable for the polymerization reaction. **按聚合物计，并且基于由80%单体转变获得的聚合物预期量。  ** a polymer basis, based on the expected amount of the polymer and from 80% monomer conversion is obtained. 本发明的方法例示于四氟乙烯(TFE)、全氟(甲基乙烯基)醚(PMVE)和全氟_8(氰基-5-甲基-3，6- 二氧杂-1-辛烯)(8CNVE)的氟烃弹性体共聚物的聚合反应中。  The method of the present invention is illustrated in Example tetrafluoroethylene (TFE), perfluoro (methyl vinyl) ether (PMVE) and perfluoro _8 (cyano-5-methyl-3,6-dioxa - polymerization 1- octene) (8CNVE) fluorocarbon elastomeric copolymer. 3.4g/小时的速率单独加入液体单体8CNVE。 3.4g / hr liquid monomer 8CNVE added separately. 整个反应期间，温度保持在85°C，压力保持在4.lMPa(600psi)，并且pH保持在6.3。 Throughout the reaction, the temperature was maintained at 85 ° C, pressure was maintained at 4.lMPa (600psi), and the pH is maintained at 6.3. 乳液共聚物固体含量最终达到26重量％。 The solid content of the final emulsion copolymer of 26 wt%. 经由下泄阀连续除去聚合物乳液，并且排出未反应的单体。 Polymer emulsion was removed continuously via letdown valve and discharging unreacted monomer. 通过首先以8升去离子水每升乳液的比率用去离子水稀释所述乳液，接着在60°C温度下，通过加入640立方厘米硫酸镁溶液(100g硫酸镁七水合物每升去离子水)每升乳液，将氟烃弹性体共聚物从所述乳液中分离出来。 8 ratio by first liters of deionized water per liter of emulsion of the emulsion was diluted with deionized water, followed by 60 ° C for a temperature, 640 cm3 by the addition of magnesium sulfate solution (100g of magnesium sulfate heptahydrate per liter of deionized water ) per liter of the emulsion, the fluorocarbon elastomeric copolymer is separated from the emulsion. 将所得浆液过滤，并且在60°C下，将得自一升乳液的聚合物固体再次分散于8升去离子水中。 The resulting slurry was filtered, and at 60 ° C, obtained from one liter of the emulsion polymer solids redispersed in 8 liters of deionized water. 过滤后，在70°C的强制通风烘箱中将湿碎屑干燥48小时。 After filtration, in a forced air oven at 70 ° C in the wet crumb was dried for 48 hours. 反应器每运作一小时的含氟弹性体共聚物的收率为82.5g。 Each reactor operating in a yield of 82.5g of a fluorine-containing elastomeric copolymer of one hour. 所述共聚物组成为46.7重量％ PMVE，3.04重量％ 8CNVE，余量为TFE0 在含有0.1g 共聚物的100g Flutec®PP-1I (F2 Chemicals Ltd.，Preston, UK)溶液中，测得所述共聚物具有0.91的特性粘度。 The copolymer composition of 46.7 wt.% PMVE, 3.04 wt% 8CNVE, the balance TFE0 0.1g 100g Flutec®PP-1I containing copolymer (F2 Chemicals Ltd., Preston, UK) solution, measured in the copolymer has an intrinsic viscosity of 0.91. 重复上文实施例中描述的通用方法以制得TFE、PMVE和8CNVE的氟烃弹性体共聚物，不同的是单独使用DA，而没有PFPEA 2。  repeat the above general procedure described in the embodiment to produce TFE, PMVE and fluorocarbon elastomeric copolymer of 8CNVE, except that the DA alone, without PFPEA 2. 29.3g亚硫酸钠的去离子水溶液组成。 29.3g of sodium sulfite in deionized water composition. 使用隔膜压缩机，以恒定的速率加入TFE^l.7g/h)和PMVE (51.8g/h)的混合物。 Using a diaphragm compressor, TFE was added at a constant rate mixture ^ l.7g / h) and PMVE (51.8g / h) of the. 以3.1g/小时的速率单独加入液体单体8CNVE。 To 3.1g / hr liquid monomer 8CNVE added separately. 整个反应期间，温度保持在75°C，压力保持在4.1MPa (600psi)，并且pH保持在8.9。 Throughout the reaction, the temperature was maintained at 75 ° C, pressure was maintained at 4.1MPa (600psi), and the pH is maintained at 8.9. 经由下泄阀连续除去共聚物乳液，并且排出未反应的单体。 Copolymer emulsion was removed continuously via letdown valve and discharging unreacted monomer. 总体上，聚合反应进行地很不充分。 In general, the polymerization reaction is carried out to very full. 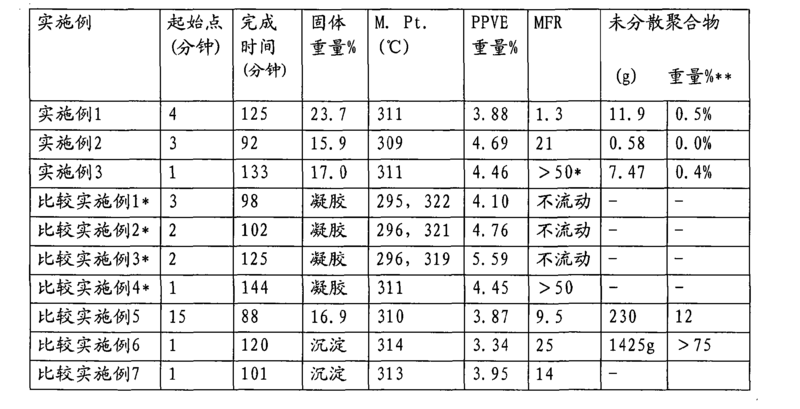 最大乳液共聚物固体含量仅达到约2重量％。 Maximum emulsion copolymer solids content of only about 2 wt%. 制得的乳液不稳定，并且制得的大多数氟烃弹性体共聚物凝结并且沉积于反应器中。 Destabilize the emulsion was prepared, and the resulting fluorocarbon elastomer copolymers Most coagulation and deposition in the reactor. 回收的少量共聚物坚硬而且易碎，并且无法用标准方法分析。 The recovered copolymer of hard and friable small amount, and can not be analyzed using standard methods. 本发明的方法例示于四氟乙烯(TFE)与全氟(烷基乙烯基醚)即全氟(丙基乙烯基醚)(PPVE)的可熔融加工共聚物的聚合反应中。  The method of the present invention is illustrated in tetrafluoroethylene (TFE) polymerisation reaction with perfluoro (alkyl vinyl ether), i.e., perfluoro (propyl vinyl ether) (PPVE) melt-processible copolymers. 将如表6A中所示的三种短链含氟表面活性剂用于聚合剂与PFPEA 2的组合中，并且与单独使用短链含氟表面活性剂作为聚合反应表面活性剂进行比较。 As shown in Table 6A, the three short-chain fluorinated surfactants used in combination with a polymerization agent in PFPEA 2, and with the use of short chain fluorinated surfactant alone as the polymerization surfactant compared. 表6B将结果进行了总结。 Table 6B results are summarized. 用于此实施例的聚合剂可作为浓缩液，通过在小瓶中将4.01gC3F70CF2CF2C00NH4W入到16.04g去离子水中，并且摇晃小瓶直至混合物澄清来制备。  for this embodiment may be used as the polymerization agent concentrate in the vial by 4.01gC3F70CF2CF2C00NH4W into 16.04g of deionized water, and the mixture was shaken until a clear vial was prepared. 加入PFPEA 2 (Ig)，然后加入6滴30重量％的氢氧化铵。 Was added PFPEA 2 (Ig), followed by addition of 6 drops of 30 wt% ammonium hydroxide. 再次摇晃小瓶，以获得略微浑浊的混合物。 Again shake the vial to obtain a slightly cloudy mixture. 在搅拌下将此混合物加入到900ml去离子水中，以获得pH为8的澄清(雾度小于约3% )聚合剂浓缩液。 The mixture was added with stirring to 900ml of deionized water to obtain a pH of 8 as a clear (haze of less than about 3%), a polymerization agent concentrate. 此实施例类似于实施例16，不同的是，通过在搅拌下将6.0gC3F7OCF2CF2COONH4加入到900mL去离子水中，来制备聚合反应表面活性剂溶液。  This Example is similar to Example 16, except that, by the 6.0gC3F7OCF2CF2COONH4 added under stirring to 900mL of deionized water, to prepare a surfactant solution polymerization reaction. 所得混合物是澄清的，具有的pH为7。 The resulting mixture is clear, has a pH of 7. 不加入PFPEA 2。 Not to join PFPEA 2. 不同的是，在聚合反应期间PPVE给料不增加，聚合反应和聚合物分离如实施例16中所述。 The difference is that, during the polymerization reaction is not increased PPVE feed, the polymerization reaction and the polymer isolated as described in Example 16. 结果总结于表6A和6B中。 The results are summarized in Table 6A and 6B. 与具有非常少的未分散聚合物的实施例16相比，此实施例中制得的聚合物有8.9%未分散，表明C3F70CF2CF2C00NH4独自是较差的表面活性剂，然而它与PFPEA 2组合却很有效。 Compared to the embodiment with very little undispersed polymer 16, in this embodiment, the polymers are prepared in 8.9% undispersed indicating C3F70CF2CF2C00NH4 alone is a poor surfactant, but it is very PFPEA 2 in combination with effective. a)将1.3g PFPEA 2、1.75g叔丁醇、2.06g去离子水和0.2g 30重量％氢氧化铵加入到小瓶中。  a) The 1.3g PFPEA 2,1.75g ​​tert-butanol, 2.06g deionized water and 0.2g 30 wt% ammonium hydroxide was added to the vial. 摇晃后，混合物澄清。 After shaking, the mixture clarified. 在搅拌下将混合物滴加到510g去离子水中。 Under stirring the mixture was added dropwise 510g of deionized water. 所得混合物(混合物A)是澄清的，具有的pH为9。 The resulting mixture (mixture A) was clear, it has a pH of 9.
 b)将5.2g C2F5OCF (CF3) COOH放入到小瓶中，并且加入3.0g 30重量％氢氧化铵。  b) The 5.2g C2F5OCF (CF3) COOH placed into a vial, and add 3.0g 30 wt% ammonium hydroxide. 在流动的冷水下摇晃盖封的小瓶，以消除中和热。 Under running cold water lidding vial shaken to remove heat of neutralization. 所得混合物是澄清的。 The resulting mixture was clear. 将它加入到混合物A中。 The mixture A was added to it. 所得混合物(混合物B)保持澄清。 The resulting mixture (mixture B) remains clear. 其具有的pH为10。 Having a pH of 10.
 c)将2.45g PFPEA 2,3.3g叔丁醇、3.88g去离子水和0.47g 30重量％氢氧化铵依次加入到小瓶中，将其盖封并且摇晃，直至内容物为单相并且澄清。  c) The 2.45g PFPEA 2,3.3g tert-butanol, 3.88 g of deionized water and 0.47g 30 wt% ammonium hydroxide were added to the vial, which was sealed lid and shake until the contents of a single phase and clarification. 在剧烈搅拌下将此混合物滴加到500mL去离子水中。 Under vigorous stirring and the mixture was dropwise added 500mL of deionized water. 所得混合物是澄清的，具有的pH为10。 The resulting mixture is clear, has a pH of 10. 这是混合物C。 This is a mixture C.
 d)将9.8g C2F5OCF (CF3) COOH加入到小瓶中，其后还加入3.53g 30重量％氢氧化铵。  d) The 9.8g C2F5OCF (CF3) COOH was added to the vial, followed by further addition of 3.53 g 30 wt% ammonium hydroxide. 在流动的冷水下摇晃盖封的小瓶，以消除中和热。 Under running cold water lidding vial shaken to remove heat of neutralization. 所得混合物是澄清的。 The resulting mixture was clear. 在剧烈搅拌下将此混合物滴加到混合物C中，获得混合物D，这是澄清的，并且具有的pH为9.5。 Under vigorous stirring and the mixture was dropwise added to the mixture in the C, D to obtain a mixture, which is clear and has a pH of 9.5. 然后将混合物B和D混合在一起，以制得混合物BD，其是澄清的(雾度小于约3% )。  and then the mixture was mixed with B and D, to produce a mixture of the BD, which is a clear (haze of less than about 3%). 使用混合物BD作为聚合剂浓缩液，依照实施例16中的聚合反应步骤。  The mixture used as a polymerization agent concentrate BD, in accordance with the polymerization reaction procedure of Example 16. 结果总结于表6A和6B中。 The results are summarized in Table 6A and 6B. 通过向小瓶中依次加入以下物质，制备用于此实施例的聚合剂:3.0克Krytox®FSL、4.0克叔丁醇和4.75克DI水。  by sequentially adding the following substances to the vial, for the preparation of this embodiment the polymerization agent: 3.0 g Krytox®FSL, 4.0 g of t-butanol and 4.75 g DI water. 将其盖封并且剧烈摇晃，以制得乳状混合物。 Which lidding and shaken vigorously to prepare a milky mixture. 将0.5克30重量％氢氧化铵加入到所述小瓶中，并且再次将小瓶盖封并且摇晃，以获得起泡混合物，其在静置后变成无色透明的单相。 0.5 g of 30 wt% ammonium hydroxide was added to the vial, and the vial was again capped and shaken to obtain a foamed mixture, it becomes colorless and transparent single phase upon standing. 在剧烈搅拌的同时，将此小瓶中的内容物缓慢加入到900克去离子脱气水中。 While vigorously stirring, was slowly added to the contents of this vial and 900 grams of deionized degassed water. 所得混合物是无色透明的。 The resulting mixture was colorless and transparent. 向第二小瓶中加入12克C2F5OCF (CF3) COOH。  12 g C2F5OCF (CF3) COOH to the second vial. 向其中加入4.3克30重量％的氢氧化铵。 Thereto was added 4.3 g of 30 wt% ammonium hydroxide. 将小瓶盖封，并且在流动的冷水下摇晃，以消除反应热。 The vial was sealed and shaken under cold running water to remove the heat of reaction. 所得混合物是无色透明的。 The resulting mixture was colorless and transparent. 同样在剧烈搅拌的同时，将此第二小瓶中的内容物缓慢加入到上述Krytox混合物中。 Also, while vigorously stirring, the contents of the second vial was added slowly to this mixture Krytox above. 所得聚合剂浓缩液是无色透明的(雾度小于约3% )，用pH试纸测定，pH为9.5。 The resulting concentrate solution polymerization was colorless and transparent (haze of less than about 3%), measured with pH paper, pH 9.5. 依照实施例16中的聚合反应步骤。  In accordance with embodiments polymerization procedure of Example 16. 结果总结于表6A和6B中。 The results are summarized in Table 6A and 6B. 通过加入15g C2F5OCF (CF3) COOH和5g 30重量％氢氧化铵，制备用于此实施例的聚合剂。  (CF3) COOH and 5g 30 wt% ammonium hydroxide by the addition of 15g C2F5OCF, preparation of a polymerization agent for this embodiment. 将小瓶盖封，并且在流动的冷水下摇晃，以消除反应热。 The vial was sealed and shaken under cold running water to remove the heat of reaction. 所得混合物是无色透明的。 The resulting mixture was colorless and transparent. 在搅拌下将其滴加到900mL去离子水中，获得略微浑浊的pH为8.5的溶液。 Under stirring dropwise added 900mL of deionized water to obtain a slightly cloudy solution having a pH of 8.5. 九滴30重量％氢氧化铵，使PH达到9.5。 Nine drops of 30 wt% ammonium hydroxide, so that PH 9.5. 所述混合物仍略微浑浊。 The mixture was still slightly hazy. 依照实施例16中的聚合反应步骤。  In accordance with embodiments polymerization procedure of Example 16. 结果总结于表6A和6B中。 The results are summarized in Table 6A and 6B. 与不同之处在于聚合剂中包含PFPEA 2的实施例17和18相比，该比较实施例13制得包含7.7%未分散聚合物的分散体。 And except that the polymerization agent comprises PFPEA 2 of Example 17 and 18 compared to the Comparative Example 13 was prepared a dispersion containing 7.7% undispersed polymer. 实施例17和18不产生未分散的聚合物。 17 and 18 does not occur in Example undispersed polymer. 通过将13.6克C4H9CH2CH2SO3Na (F0RAFAC™42)加入到900g去离子脱气水中，来制备聚合剂。  by adding 13.6 g C4H9CH2CH2SO3Na (F0RAFAC ™ 42) was added to 900g of deionized, deaerated water, to prepare a polymerization agent. 将此经由磁力搅拌器搅拌，直到固体完全溶解。 This was stirred via a magnetic stirrer until the solid was completely dissolved. 所得混合物是无色透明的，具有的pH = 9.5。 The resulting mixture was colorless and transparent, having a pH = 9.5. 向小瓶中加入3.4克PFPEA 2,4.5 3克叔丁醇和5.41克去离子水。  The vial was added to 3.4 g PFPEA 2,4.5 3 g tert-butanol and 5.41 g of deionized water. 将小瓶盖封并且摇晃，以制得乳状分散体。 The vial was sealed and shaken to produce a milky dispersion. 向其中加入0.58克30重量％的氢氧化铵。 Thereto was added 0.58 g of 30 wt% ammonium hydroxide. 将小瓶再次盖封并且剧烈摇晃，以获得起泡混合物。 The vial was again capped and shaken vigorously lid, to obtain a foamed mixture. 静置后，内容物形成无色透明的单相。 After standing, the contents were colorless and transparent single phase is formed. 将小瓶内容物通过吸移管加入到上述913.6克C4H9CH2CH2SO3Na混合物中，所述吸移管浸没到澄清液体表面下方，并且进入到通过在磁力搅拌器上剧烈搅拌所述混合物而形成的高剪切区域内。 The contents of the vial by pipette added to the above mixture 913.6 g C4H9CH2CH2SO3Na, the pipette is immersed into a clear liquid below the surface, and into the regions of high shear by vigorous stirring on a magnetic stirrer and the mixture is formed. 在加入了小瓶所有内容物后，聚合剂浓缩液是无色透明的(雾度小于约3% )，用pH试纸测得pH = 10.5。 After addition of the entire contents of the vial, a polymerization agent concentrate was colorless and transparent (haze of less than about 3%), as measured with pH paper pH = 10.5. 通过将17克C4H9CH2CH2SO3Na (F0RAFAC™42)加入到900g去离子脱气水中，来制备用于此实施例的聚合反应表面活性剂溶液。  by 17 g C4H9CH2CH2SO3Na (F0RAFAC ™ 42) was added to 900g of deionized, deaerated water, to prepare a surfactant solution polymerization used in this embodiment. 将此经由磁力搅拌器搅拌，直到固体完全溶解。 This was stirred via a magnetic stirrer until the solid was completely dissolved. 所得混合物是无色透明的，具有的pH = 9.5。 The resulting mixture was colorless and transparent, having a pH = 9.5. 依照实施例16中的聚合反应步骤，不同的是加入6200g脱气水。  In accordance with the polymerization reaction procedure of Example 16, except that the degassed water was added 6200g. 结果总结于表6A和6B中。 The results are summarized in Table 6A and 6B. 与其中C4H9CH2CH2SO3Na与PFPEA 2组合作为聚合反应中的聚合剂，仅产生约I %未分散聚合物的实施例19相比，C4H9CH2CH2SO3Na单独作为聚合反应表面活性剂，获得包含30%未分散聚合物的聚合物分散体。 And wherein C4H9CH2CH2SO3Na PFPEA 2 in combination with a polymerization initiator in the polymerization reaction, produces only about I% Example 19 as compared to undispersed polymer, C4H9CH2CH2SO3Na alone as the polymerization surfactant, a polymerization to obtain a polymer containing 30% of undispersed dispersion thereof. 1.一种包括在包含引发剂和聚合剂的含水介质中使至少一种氟化单体聚合以形成含氟聚合物颗粒的水分散体的方法，所述聚合剂包含: 数均分子量为至少800g/mol的氟聚醚酸或其盐；和具有下式结构的含氟表面活性剂: [R1-On-L-AlY+ 其中: R1为可包含醚键的直链或支链的部分氟化或完全氟化的脂族基团； η为O或I ; L为可以非氟化、部分氟化或完全氟化的并且可包含醚键的直链或支链亚烷基； Α_为选自下列的阴离子基团:羧酸根、磺酸根、磺酰胺阴离子和膦酸根；并且Y+为氢、铵或碱金属阳离子； 前提条件是R1-On-L-的链长不大于6个原子， 其中所述含氟表面活性剂构成所述聚合剂的至少55重量％。 1. comprising in an aqueous medium comprising initiator and polymerization agent manipulation of at least one fluorinated monomer to form the water method of dispersion of particles of fluoropolymer, said polymerization agent comprising: a number average molecular weight of at least 800g / mol of fluoropolyether acid or salt thereof; and a fluorinated surfactant having the following structural formula: [R1 On-L-AlY-+ wherein: R1 is a linear or branched chain may contain an ether bond partially fluorinated or fully fluorinated aliphatic group; [eta] is O or I; L is can be a non-fluorinated, partially fluorinated, or a straight-chain or branched alkylene group and may contain an ether bond fully fluorinated; # alpha # _ selected from the group from the following anionic groups: carboxylate, sulfonate, sulfonamide anion, and phosphonate; and Y + is hydrogen, ammonium or alkali metal cation; with the proviso that R1-on-L- chain grow to 6 atoms, wherein the fluorinated surfactant constituting the polymerizer at least 55 wt%. 2.权利要求1的方法，其中所述R1-On-L-的链长为3至6个原子。 The method of claim 1, wherein the R1-On-L- chain length of 3 to 6 atoms. 3.权利要求1的方法，其中所述R1-On-L-的链长为4至6个原子。 The method of claim 1, wherein the R1-On-L- chain length of 4-6 atoms. 4.权利要求1的方法，其中所述R1-On-L-的链长为3至5个原子。 The method of claim 1, wherein the R1-On-L- chain length of 3-5 atoms. 5.权利要求1的方法，其中所述R1-On-L-的链长为4至5个原子。 The method of claim 1, wherein the R1-On-L- chain length of 4-5 atoms. 6.权利要求1的方法，其中所述聚合剂包含的含氟表面活性剂与氟聚醚酸或其盐的重量比率为5: 1，所述聚合剂在6000ppm浓度和23°C下具有的水中表面张力比单独的含氟表面活性剂在6000ppm浓度和23°C下具有的水中表面张力低至少30%。 6. The method of claim 1, wherein said fluorinated surfactant comprises a polymeric agent with fluoropolyether acid or salt thereof in a weight ratio of 5: 1, said polymerization agent having a concentration of 6000ppm at 23 ° C and the the surface tension of water than either a fluorine-containing surfactant having a concentration of 6000ppm at 23 ° C and the surface tension of water is at least 30%. 7.权利要求1的方法，其中η为I。 The method of claim 1, wherein η is I. 8.权利要求7的方法，其中: R1为具有I至3个碳原子的可包含醚键的直链或支链的部分氟化或完全氟化的烷基；并且L为选自-CX (R2)-的亚烷基，其中R2为氟或全氟甲基，并且X为氢或氟、和-CZ1Z2CZ3Z4-,其中Z1、Z2、Z3和Z4独立地选自氢或氟。 The method of claim 7, wherein: R1 having I to 3 carbon atoms, a partially fluorinated linear or branched, may contain an ether bond or fully fluorinated alkyl group; and L is selected from -CX ( R2) - alkylene group, wherein R2 is fluorine or perfluoromethyl and X is hydrogen or fluorine, and -CZ1Z2CZ3Z4-, wherein Z1, Z2, Z3 and Z4 are independently selected from hydrogen or fluorine. 9.权利要求8的方法，其中: L 为选自下列的亚烷基:_CF (CF3) _、-CF2-、-CF2CF2-、-CHFCF2-和-CF2CHF-。 9. The method of claim 8, wherein: L is selected from the group consisting of an alkylene group: _CF (CF3) _, - CF2 -, - CF2CF2 -, - CHFCF2- and -CF2CHF-. 10.权利要求7的方法，其中R1为具有2至3个碳原子的直链的部分氟化或完全氟化的烷基。 10. The method of claim 7, wherein R1 is a linear partially fluorinated 2-3 carbon atoms, or fully fluorinated alkyl group. 11.权利要求1的方法，其中R1被完全氟化。 11. The method of claim 1, wherein R1 is fully fluorinated. 12.权利要求7的方法，其中: R1 为CF3CF2CF2-； L 为-CF(CF3)-;并且A_为羧酸根；并且Y+为氢或铵。 12. The method of claim 7, wherein: R1 is CF3CF2CF2-; L is -CF (CF3) -; and A_ is carboxylate; and Y + is hydrogen or ammonium. 13.权利要求1的方法，其中: η为0，并且R1和L共同包括具有4至6个碳的全氟烷基；并且Α—为磺酸根或磺酰胺阴离子。 13. The method of claim 1, wherein: η is 0, and R1 and L collectively comprise a perfluoroalkyl group having 4 to 6 carbons; and Α- is sulfonate or sulfonamide anion. 14.权利要求1的方法，其中按所述含水介质中的水的重量计，所述含水介质包含小于300ppm的具有8或更多个碳原子的全氟链烷羧酸或盐含氟表面活性剂。 14. The method of claim 1, wherein the aqueous medium by weight of water, the aqueous medium comprises perfluoroalkane carboxylic acid or salt fluorosurfactants having 8 or more carbon atoms is less than 300ppm of agents. 15.权利要求1的方法，其中数均分子量为至少800g/mol的所述氟聚醚酸包含选自羧酸、磺酸、膦酸的酸性基团。 15. The method of claim 1, wherein the selected number average molecular weight comprising carboxylic, sulfonic, phosphonic acid acidic group is at least 800g / mol of said fluoropolyether acid. 16.权利要求1的方法，其中所述氟聚醚酸或其盐具有800至3500g/mol的数均分子量。 16. The method of claim 1, wherein said fluoropolyether acid or salt thereof having a number of 800 to 3500g / mol average molecular weight. 17.权利要求1的方法，其中所述氟聚醚酸或其盐具有1000至2500g/mol的数均分子量。 17. The method of claim 1, wherein said fluoropolyether acid or salt thereof having 1000 to 2500g / mol average molecular weight. 18.权利要求1的方法，其中按所述含水介质中的水的重量计，所述聚合剂在所述含水介质中的含量为5ppm至lOOOOppm。 18. The method of claim 1, wherein the aqueous medium by weight of water, the content of the polymerization in the aqueous medium is 5ppm to lOOOOppm. 19.权利要求1的方法，其中按所述含水介质中的水的重量计，所述聚合剂在所述含水介质中的含量为5ppm至3000ppm。 19. The method of claim 1, wherein the aqueous medium by weight of water, the content of the polymerization in the aqueous medium is 5ppm to 3000ppm. 20.权利要求1的方法，其中由所述方法形成的所述含氟聚合物颗粒的水分散体具有至少10重量％的含氟聚合物固体含量。 20. The method of claim 1, wherein said aqueous dispersion of fluoropolymer particles formed by said method having at least 10% by weight of the solids content of fluoropolymer. 21.权利要求1的方法，其中由所述方法形成的所述含氟聚合物颗粒的水分散体具有20重量％至65重量％的含氟聚合物固体含量。 21. The method of claim 1, wherein said aqueous dispersion of fluoropolymer particles formed by said method having a solids content of 20% by weight of a fluorine-containing polymer to 65% by weight. 22.权利要求1的方法，其中所述至少一种氟化单体选自四氟乙烯、六氟丙烯、三氟氯乙烯、三氟乙烯、六氟异丁烯、全氟烷基乙烯、氟代乙烯基醚、氟乙烯、偏二氟乙烯、全氟_2，2- 二甲基-1，3- 二氧杂环戊烯、全氟-2-亚甲基-4-甲基-1，3- 二氧杂环戊烷、全氟(烯丙基乙烯基醚)和全氟(丁烯基乙烯基醚)。 22. The method of claim 1, wherein said at least one fluorinated monomer selected from tetrafluoroethylene, hexafluoropropylene, chlorotrifluoroethylene, trifluoroethylene, hexafluoroisobutylene, perfluoroalkyl ethylene, fluoroethylene ether, vinyl fluoride, vinylidene fluoride, perfluoro _2,2- dimethyl-1,3-dioxole, perfluoro-4-methyl-2-methylene-1,3 - dioxolane, perfluoro (allyl vinyl ether) and perfluoro (butenyl vinyl ether). 23.权利要求1的方法，其中产生的所述含氟聚合物颗粒包含共聚单体含量不超过I重量％的聚四氟乙烯或改性聚四氟乙烯。 23. The method of claim 1, wherein said fluoropolymer particles produced contain a comonomer content of not more than I% by weight polytetrafluoroethylene or modified polytetrafluoroethylene. 24.权利要求23的方法，其中所述聚四氟乙烯或改性聚四氟乙烯具有至少IO8Pa *s的熔融蠕变粘度。 24. The method of claim 23, wherein the polytetrafluoroethylene or modified polytetrafluoroethylene having a melt creep viscosity of at least the IO8Pa * s.
25.权利要求1的方法，其中所述含氟表面活性剂构成所述聚合剂的至少65重量％。 25. The method of at least 65 wt claimed in claim 1, wherein said fluorinated surfactant constituting the polymerizer%. 26.权利要求1的方法，其中产生的所述含氟聚合物颗粒包含可熔融加工的共聚物，所述共聚物包含至少60至98重量％的四氟乙烯单元和2至40重量％的至少一种其它单体。 Of at least 26. The method of claim 1, wherein said fluoropolymer particles comprising a copolymer produced by melt processing, the copolymer comprises at least 60 to 98 weight percent of tetrafluoroethylene units and from 2 to 40% by weight one other monomer. 27.权利要求1的方法，其中以水为基准，所述含水介质包含不超过IOppm的全氟聚醚油。 27. The method of claim 1, wherein based on water, the aqueous medium comprises no more than IOppm perfluoropolyether oil. 28.权利要求1的方法，其中所述含水介质在聚合反应开始时不含含氟聚合物晶种。 The method of 1, wherein the aqueous medium is free of fluoropolymer seed at the start of the polymerization reaction as claimed in claim 28,. 29.权利要求1的方法，其中按生成的含氟聚合物的总重量计，所述聚合反应生成小于10重量％的未分散含氟聚合物。 29. The method of claim 1, wherein the total weight of fluoropolymer produced, the polymerization reaction of 10 wt% undispersed fluoropolymer is less than. 30.权利要求1的方法，其中按生成的含氟聚合物的总重量计，所述聚合反应生成小于3重量％的未分散含氟聚合物。 30. The method of claim 1, wherein the total weight of fluoropolymer produced, the polymerization reaction is less than 3% by weight undispersed fluoropolymer. 31.一种聚合含氟聚合物的方法，所述方法包括: 使较小量的数均分子量为至少800g/mol的氟聚醚酸与较大量的含氟表面活性剂混合以形成酸混合物，所述含氟表面活性剂具有下式结构: [R1-On-L-AlY+ 其中:R1为可包含醚键的直链或支链的部分氟化或完全氟化的脂族基团； η为O或I ; L为可以非氟化、部分氟化或完全氟化的并且可包含醚键的直链或支链亚烷基； Α_为选自下列的阴离子基团:羧酸根、磺酸根、磺酰胺和膦酸根；并且Y.为氢； 前提条件是R1-On-L-的链长不大于6个原子； 将所述酸混合物分散到含水聚合反应介质中，以提供分散的氟聚醚酸或盐以及表面活性剂或所述表面活性剂的盐； 在存在引发剂和所述分散的氟聚醚酸或盐以及含氟表面活性剂或所述表面活性剂盐的情况下，在所述含水聚合反应介质中聚合至少一种氟化单体，以形成含氟聚合物颗粒的水 31. A method for polymerization of a fluorine-containing polymer, the method comprising: making the number average molecular weight of a relatively small amount of at least 800g / mol fluoropolyether acid mixed with a larger amount of fluorinated surfactant mixture to form an acid, the fluorine-containing surfactant having the formula: [R1-On-L-AlY + wherein: R1 is a straight-chain or branched partially fluorinated or fully fluorinated chain aliphatic groups may contain ether linkages; [eta] is O or I; L is can be a non-fluorinated, partially fluorinated, or a straight-chain or branched alkylene group and may contain an ether bond fully fluorinated; # alpha # _ selected from the group consisting of anionic groups: carboxylate, sulfonate , and the sulfonamide phosphonate; and Y. is hydrogen; with the proviso that R1-on-L- chain grow to 6 atoms; said acid mixture is dispersed in the aqueous polymerization medium to provide a dispersion of fluorosilicone salts of ether acids or salts and a surfactant or the surfactant; in the presence of initiator and said dispersed fluoropolyether acid or salt and fluorosurfactant or salt of said surfactant, in the aqueous polymerization medium polymerizing at least one fluorinated monomer to form an aqueous fluoropolymer particles 散体。 Dispersion. 32.权利要求31的方法，其中在所述氟聚醚酸与含氟表面活性剂的所述混合期间，限制水的量，以便所述酸混合物包含小于50重量％的水。 32. The method of claim 31, wherein said fluoropolyether acid with said fluorosurfactant mixing period, limit the amount of water, so that said acid mixture comprises less than 50 wt% of water. 33.权利要求31的方法，所述方法还包括使所述酸混合物与氢氧化铵或碱金属氢氧化物接触，以形成所述氟聚醚酸和含氟表面活性剂的盐。 33. The method of claim 31, the method further comprising contacting said acid mixture with ammonium hydroxide or an alkali metal hydroxide, to form said fluoropolyether acid and fluorosurfactant salt thereof. 34.权利要求33的方法，其中通过在所述聚合反应介质中提供所述氢氧化铵或碱金属氢氧化物，并且将所述酸混合物混合到所述聚合反应介质中，来实现所述酸混合物与氢氧化铵或碱金属氢氧化物的所述接触，以将所述氟聚醚酸和含氟表面活性剂的所述盐分散到所述聚合反应介质中。 34. The method of claim 33, wherein said polymerization medium by providing in the ammonium hydroxide or an alkali metal hydroxide, and the acid mixture was mixed to the polymerization medium, the acid is achieved the mixture with ammonium hydroxide or an alkali metal hydroxide is contacted to said fluoropolyether acid and fluorosurfactant dispersion of said salt to the polymerization medium. 35.权利要求33的方法，其中使用含水氢氧化铵或含水碱金属氢氧化物形成包含所述氟聚醚酸和含氟表面活性剂的分散盐的水浓缩液来实现所述酸混合物与氢氧化铵或碱金属氢氧化物的所述接触，并且通过将所述水浓缩液加入到所述含水聚合反应介质中来实现所述氟聚醚酸和含氟表面活性剂的所述盐在所述聚合反应介质中的所述分散。 35. The method of claim 33, wherein the aqueous ammonium hydroxide or aqueous alkali metal hydroxide aqueous concentrate was formed containing the dispersed fluoropolyether acid salt and fluorine-containing surfactant to achieve the acid mixture with hydrogen contacting said ammonium hydroxide or an alkali metal hydroxide, the salt and the polymerization reaction medium to achieve said fluoropolyether acid and fluorosurfactant are in the water by adding to the aqueous concentrate the polymerization reaction of said dispersion medium. 36.权利要求33的方法，其中所述酸混合物与含水氢氧化铵接触。 36. The method of claim 33, wherein said acid mixture is contacted with an aqueous ammonium hydroxide. 37.权利要求35的方法，其中所述水浓缩液包含I至95重量％的水。 37. The method of claim 35, wherein said aqueous concentrate comprises I to 95% by weight of water. 38.权利要求31的方法，其中由所述方法形成的所述含氟聚合物颗粒的水分散体具有至少10重量％的含氟聚合物固体含量。 38. The method of claim 31, wherein said aqueous dispersion of fluoropolymer particles formed by said method having at least 10% by weight of the solids content of fluoropolymer. 39.一种聚合含氟聚合物的方法，所述方法包括: 将氟聚醚酸或盐和含氟表面活性剂分散到含水介质中，以形成包含分散的氟聚醚酸或盐和含氟表面活性剂的聚合剂水浓缩液，其中聚合剂包含氟聚醚酸或盐和含氟表面活性剂，所述含氟表面活性剂构成所述聚合剂的至少55重量％，所述氟聚醚酸或盐具有至少800g/mol的数均分子量，所述含氟表面活性剂具有下式结构: [R1-On-L-AlY+ 其中: R1为可包含醚键的直链或支链的部分氟化或完全氟化的脂族基团； η为O或I ; L为可以非氟化、部分氟化或完全氟化的并且可包含醚键的直链或支链亚烷基； Α_为选自下列的阴离子基团:羧酸根、磺酸根、磺酰胺阴离子和膦酸根；并且Y+为氢、铵或碱金属阳离子；前提条件是R1-On-L-的链长不大于6个原子； 将所述聚合剂水浓缩液加入到含水聚合反应介质中，以在所述介质中提供分散的 39. A method of polymerizing a fluorine-containing polymer, the method comprising: fluoropolyether acid or salt and fluorosurfactant to the aqueous dispersion medium to form a fluoropolyether acids or salts and fluorine-containing dispersion aqueous polymerization agent concentrate of a surfactant, wherein the polymerization agent comprises fluoropolyether acid or salt and fluorosurfactant, the fluorinated surfactant constituting the polymerizer at least 55% by weight, said fluoropolyether the number of acid or salt having at least 800g / mol average molecular weight of the fluorine-containing surfactant having the formula: [R1-On-L-AlY + wherein: R1 may contain ether linkages is a partially fluorinated linear or branched, or fully fluorinated aliphatic group; [eta] is O or I; L is can be a non-fluorinated, partially fluorinated or fully fluorinated and may contain an ether bond, linear or branched alkylene group; to # alpha # _ selected from the group consisting of anionic groups: carboxylate, sulfonate, sulfonamide anion, and phosphonate; and Y + is hydrogen, ammonium or alkali metal cation; with the proviso that R1-on-L- chain grow to 6 atoms; the aqueous polymerization agent concentrate was added to the aqueous polymerization medium to provide dispersed in said medium 氟聚醚酸或盐和含氟表面活性剂；以及在存在引发剂和所述分散的氟聚醚酸或盐以及所述含氟表面活性剂的情况下，在所述含水聚合反应介质中聚合至少一种氟化单体，以形成含氟聚合物颗粒的水分散体。 Fluoropolyether acid or salt and fluorosurfactant; and in the presence of initiator and said dispersed fluoropolyether acid or salt thereof, and the fluorine-containing surfactant, said aqueous polymerization medium in the polymerization at least one fluorinated monomer in water to form a dispersion of fluoropolymer particles. 40.权利要求39的方法，其中所述聚合剂水浓缩液包含0.5至50重量％的分散的氟聚醚酸或盐。 40. The method of claim 39, wherein said aqueous polymerization agent concentrate comprises from 0.5 to 50 wt.% Dispersion of fluoropolyether acids or salts. 41.权利要求39的方法，其中所述聚合剂水浓缩液包含I至95重量％的水。 41. The method of claim 39, wherein said aqueous polymerization agent concentrate comprises I to 95% by weight of water. 42.权利要求39的方法，其中调节至包含1500ppm± IOOppm分散的氟聚醚酸或盐的所述聚合剂水浓缩液具有小于10%的雾度。 42. The method of claim 39, wherein the adjusting comprises 1500ppm ± IOOppm to the polymeric dispersing agent is water fluoropolyether acids or salts concentrate having a haze of less than 10%. 43.权利要求39的方法，其中所述聚合剂水浓缩液在室温下稳定。 43. The method of claim 39, wherein said aqueous polymerization agent concentrate was stable at room temperature. 44.权利要求39的方法，其中为形成聚合剂水浓缩液的所述氟聚醚酸或盐和含氟表面活性剂的所述分散包括在分散到所述含水介质中之前使所述氟聚醚酸或盐接触分散助剂，并且在所述氟聚醚酸或盐被分散之后将所述表面活性剂加入到所述含水介质中。 44. The method of claim 39, wherein the polymerization agent to form said aqueous concentrate said fluoropolyether acid or salt and fluorosurfactant dispersing agent comprising the aqueous medium prior to dispersion of the fluoropolymer ether acid or salt thereof dispersing aids, and after said fluoropolyether acid or salt is dispersed to the surfactant is added to the aqueous medium. 45.权利要求39的方法，其中所述分散的氟聚醚酸或盐和含氟表面活性剂为铵盐或碱金属盐形式，并且将所述盐分散以形成所述水浓缩液包括在存在分散助剂的情况下使氟聚醚酸与含水铵或碱金属氢氧化物反应，随后加入作为铵盐或碱金属盐的所述表面活性剂。 45. The method of claim 39, wherein said dispersed fluoropolyether acid or salt and a fluorinated surfactant is ammonium or alkali metal salt, and dispersing said salts to form said aqueous concentrate comprises in the presence of dispersing the case that the aid is an aqueous ammonium or fluoropolyether acid is reacted with an alkali metal hydroxide, followed by addition of an alkali metal salt or an ammonium salt as the surfactant. 46.权利要求45的方法，其中所述分散助剂选自C3-C8脂族醇。 46. ​​The method of claim 45, wherein said dispersing aid is selected from C3-C8 aliphatic alcohols. 47.权利要求45的方法，其中所述分散助剂为叔丁醇。 47. The method of claim 45, wherein said dispersing aid is tert-butanol. 48.权利要求45的方法，其中含水铵或碱金属氢氧化物为氢氧化铵。 48. The method of claim 45, wherein an aqueous ammonium or alkali metal hydroxide is ammonium hydroxide. 49.权利要求39的方法，其中所述含水聚合反应介质包含小于300ppm的具有8或更多个碳原子的全氟链烷羧酸或盐含氟表面活性剂。 49. The method of claim 39, wherein said aqueous polymerization medium comprises a perfluoroalkane carboxylic acid or salt fluorosurfactants having 8 or more carbon atoms of less than 300ppm. 50.权利要求39的方法，其中所述氟聚醚盐具有800至3500g/mol的数均分子量。 50. The method of claim 39, wherein said salt fluoropolyether having a number of 800 to 3500g / mol average molecular weight. 51.权利要求39的方法，其中所述氟聚醚酸或盐具有1000至2500g/mol的数均分子量。 51. The method of claim 39, wherein said fluoropolyether acids or salts having a number of 1000 to 2500g / mol average molecular weight. 52.权利要求39的方法，其中按所述含水介质中的水的重量计，所述分散的氟聚醚酸或盐和所述含氟表面活性剂在所述含水聚合反应介质中的总量为5ppm至lOOOOppm。 Fluoropolyether acid or salt and said fluorosurfactant 52. The method of claim 39, wherein the aqueous medium by weight of water, said dispersed in the aqueous polymerization reaction medium amount of 5ppm to lOOOOppm. 53.权利要求39的方法， 其中由所述方法形成的所述含氟聚合物颗粒的水分散体具有至少10重量％的含氟聚合物固体含量。 53. The method of claim 39, wherein said aqueous dispersion of fluoropolymer particles formed by said method having at least 10% by weight of the solids content of fluoropolymer.